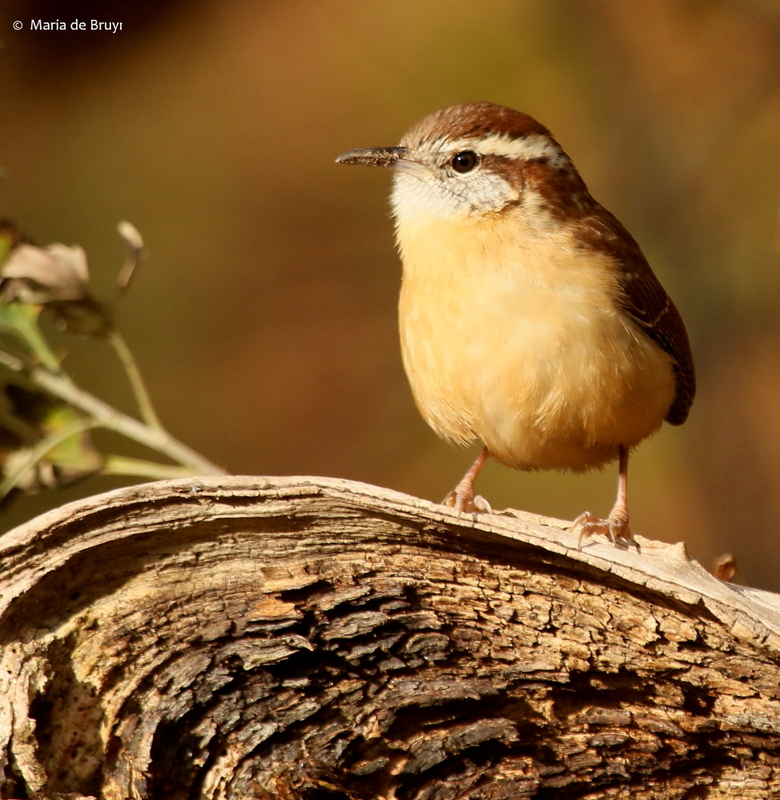 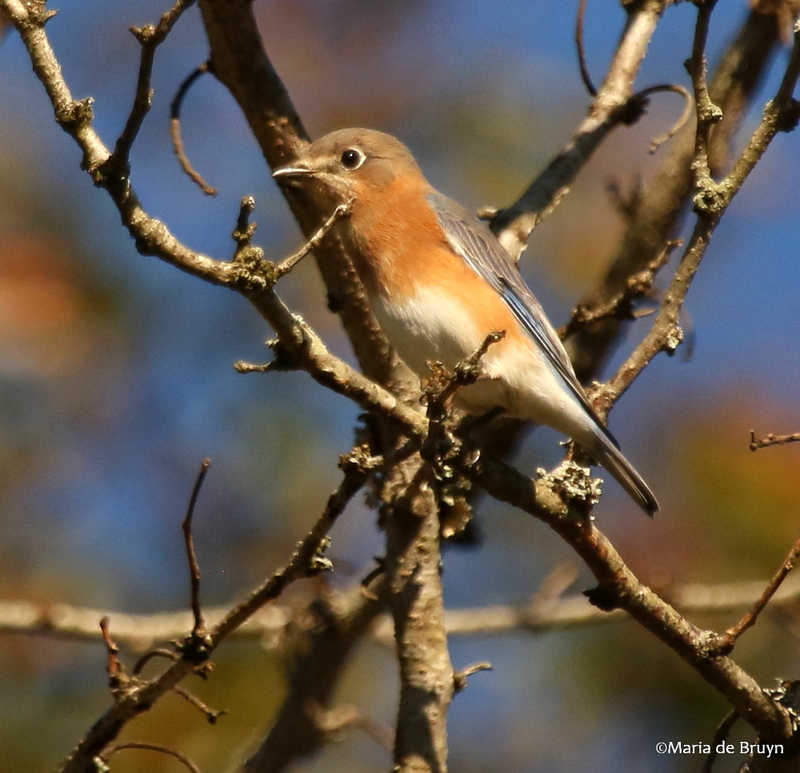 Surprise gifts from Mother Nature in 2018 – part 2: non-avian wildlife! 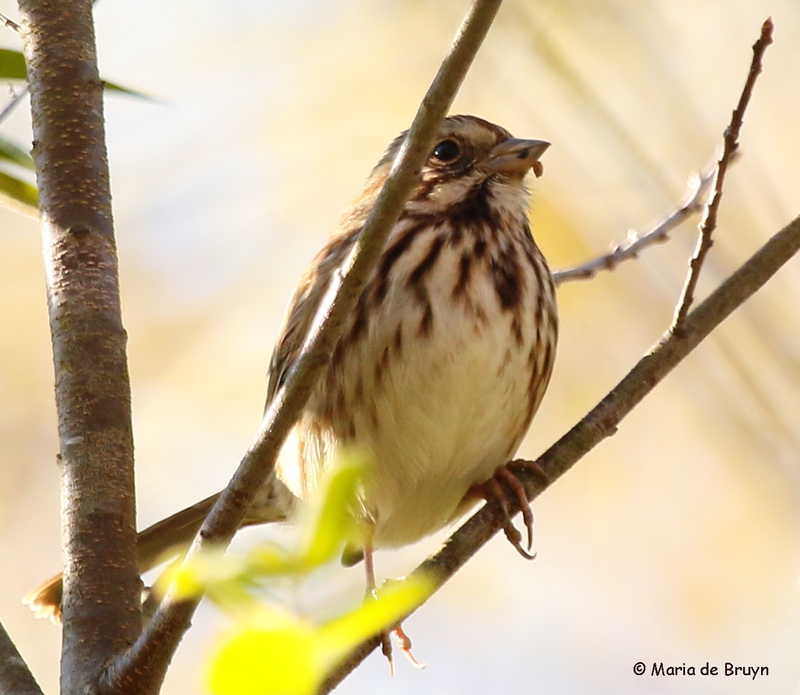 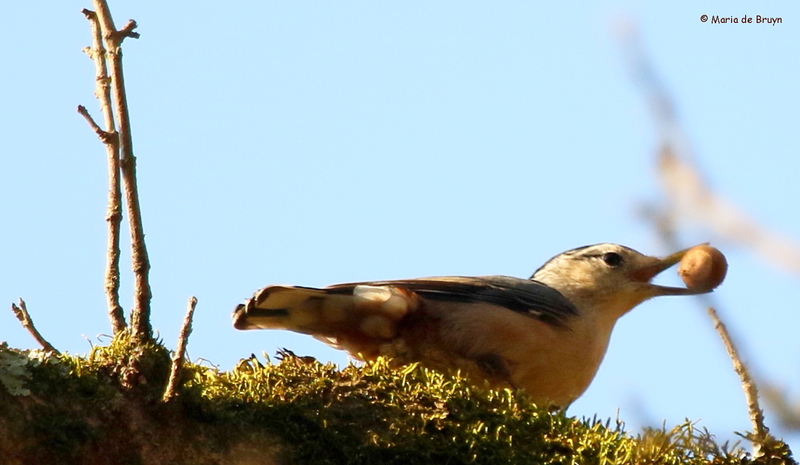 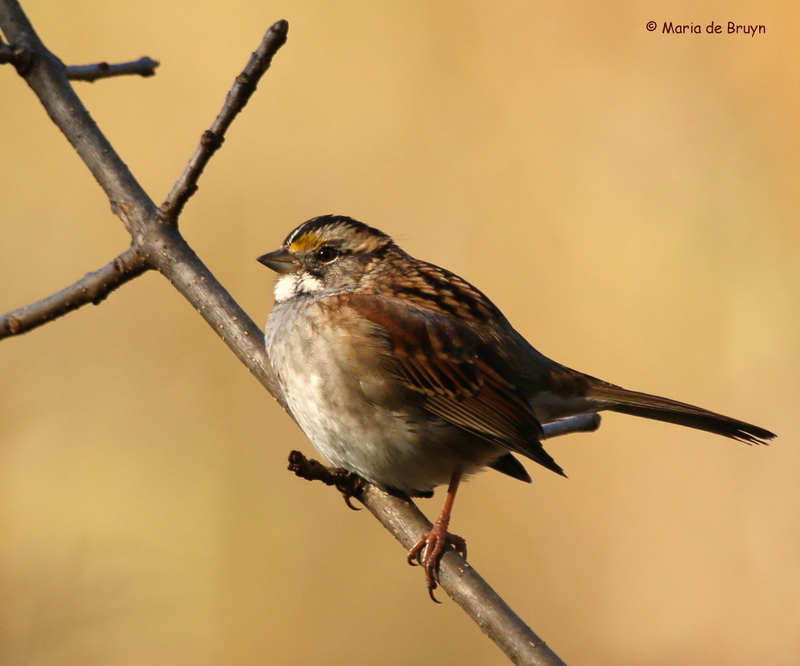 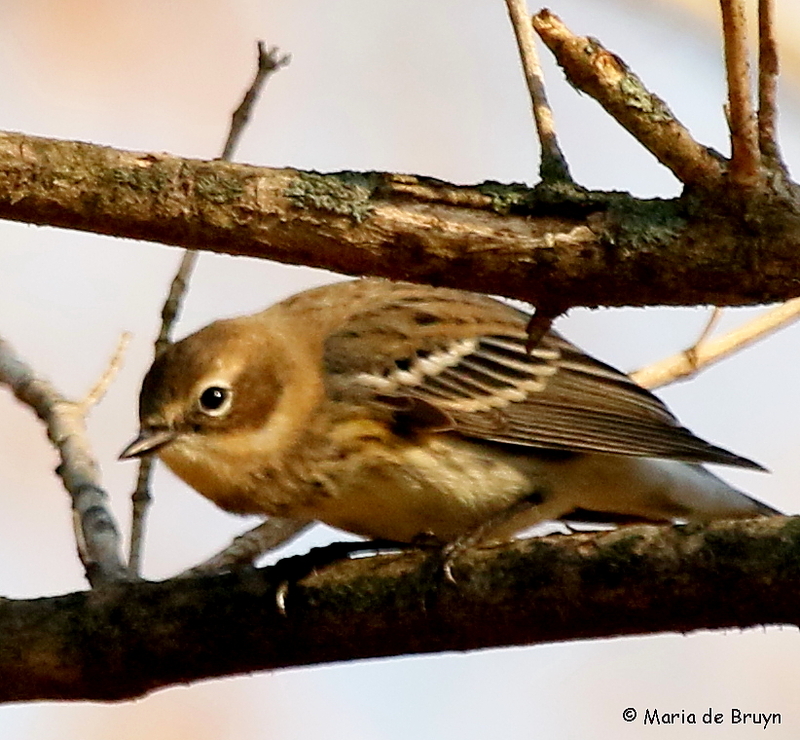 Birding is an activity I enjoy, especially since I can usually spot at least one bird during my outdoor excursions. 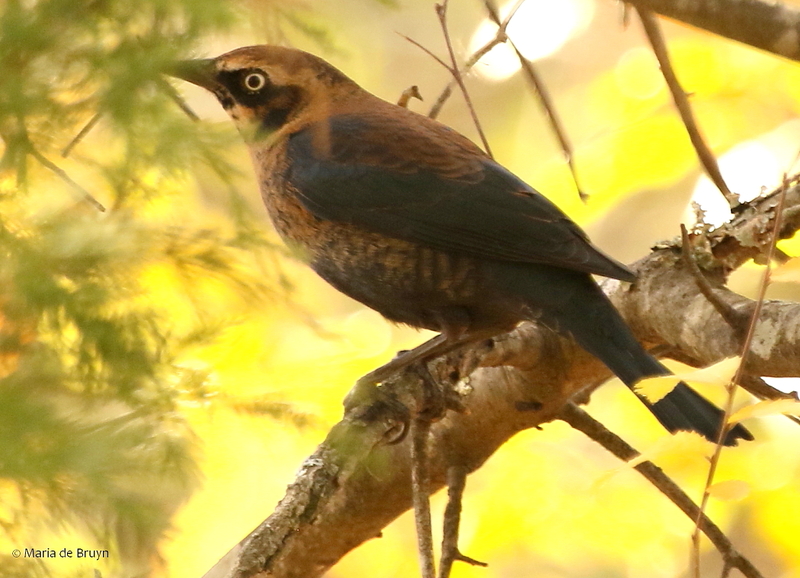 I’d prefer to call myself a “wildlifer” rather than a “birder”, however, since all kinds of other wildlife also fascinate me. 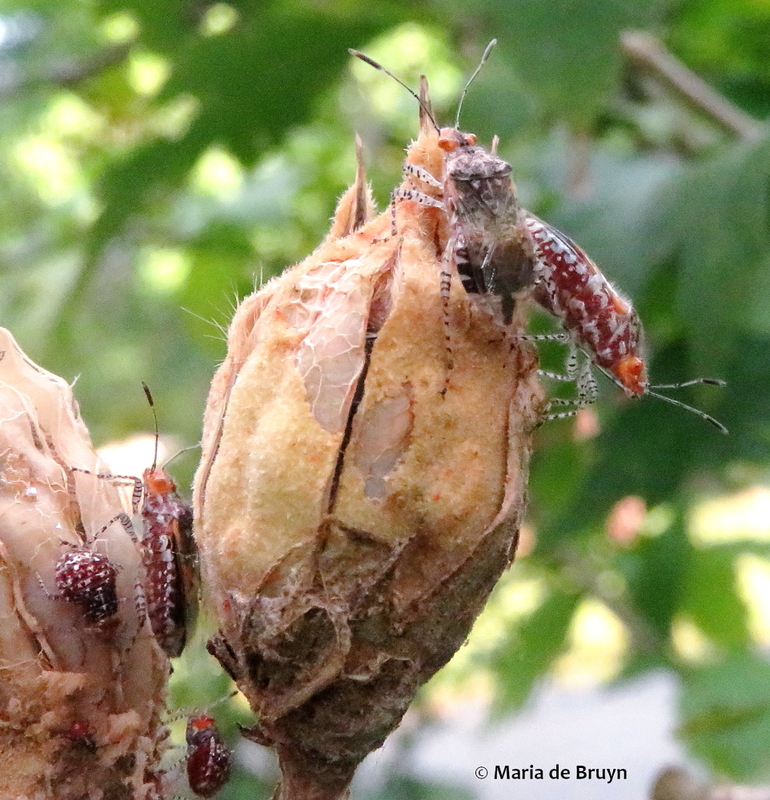 Here is a selection of some wildlife surprises and new species I saw last year, including a new plant – the honeyvine milkweed (Cynanchum laeve). 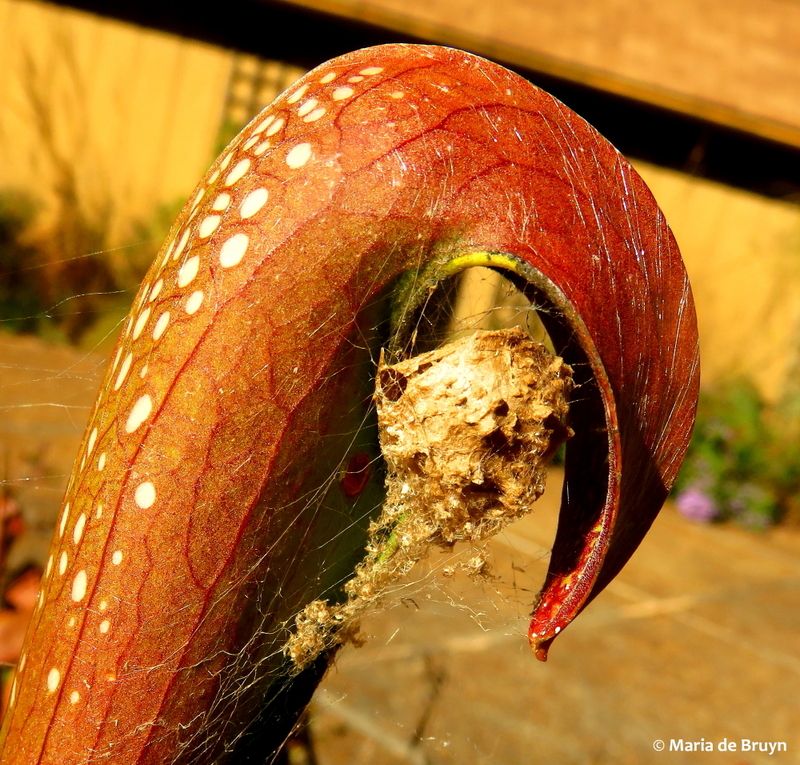 This vine is sometimes described simply as a native plant that spreads by seed and long roots; other websites call it a noxious weed. 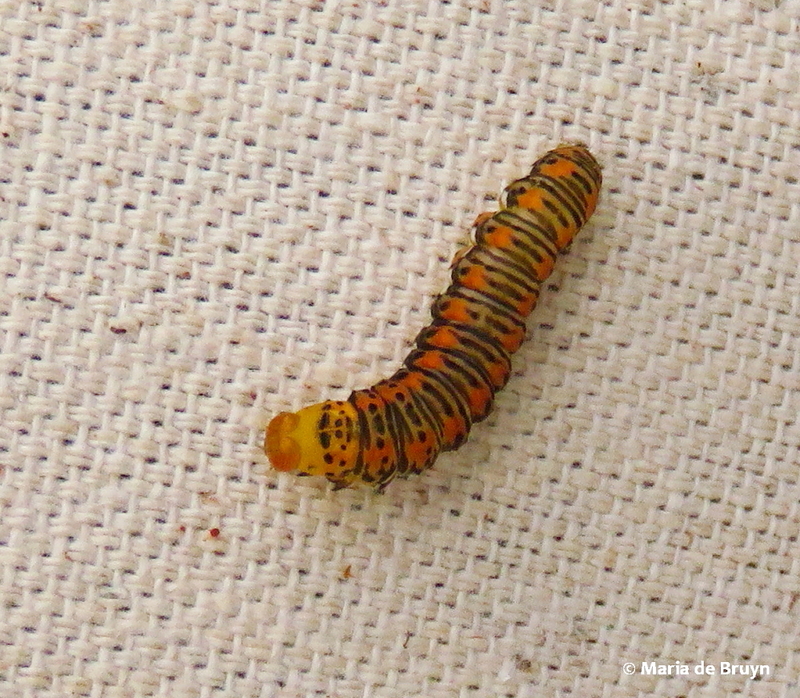 It does perhaps spread quickly but it is also a food source for monarch butterfly caterpillars so it seems like a desirable plant to me. 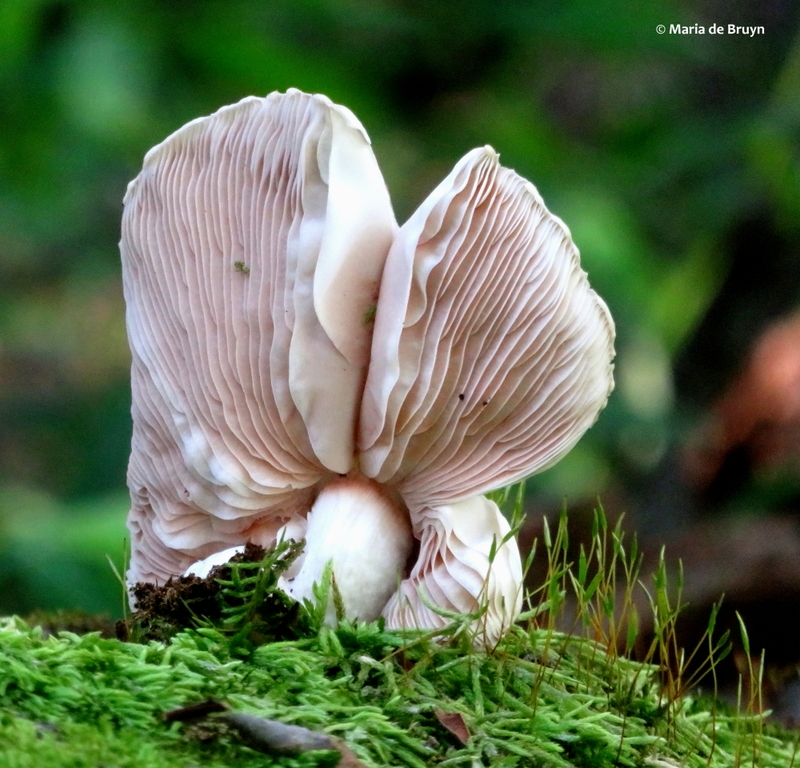 This mushroom was another one of my favorite vegetation spottings last year – it looks to me as if it is an animal with large ears. 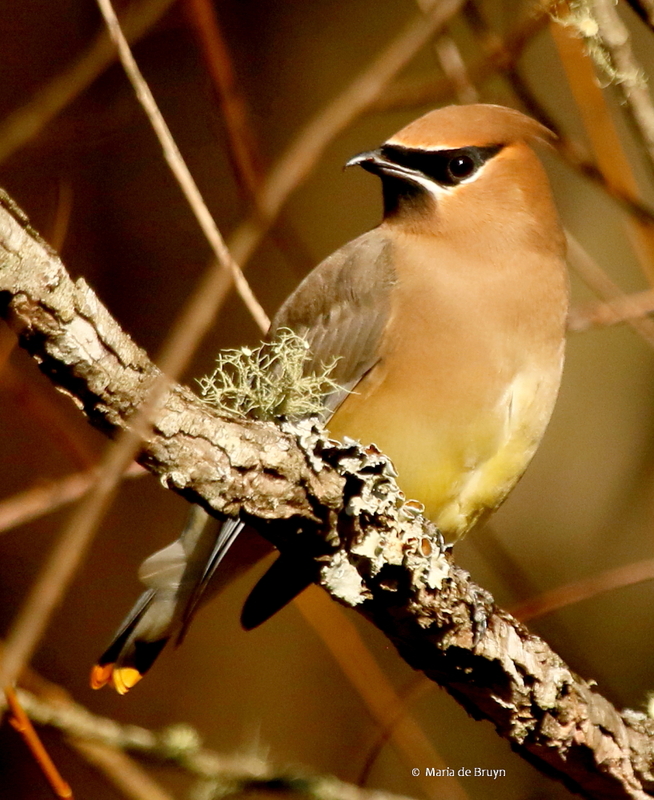 Mammals are favorites of mine but I only see a restricted number regularly – white-tailed deer, Eastern squirrels, raccoons, Eastern chipmunks. 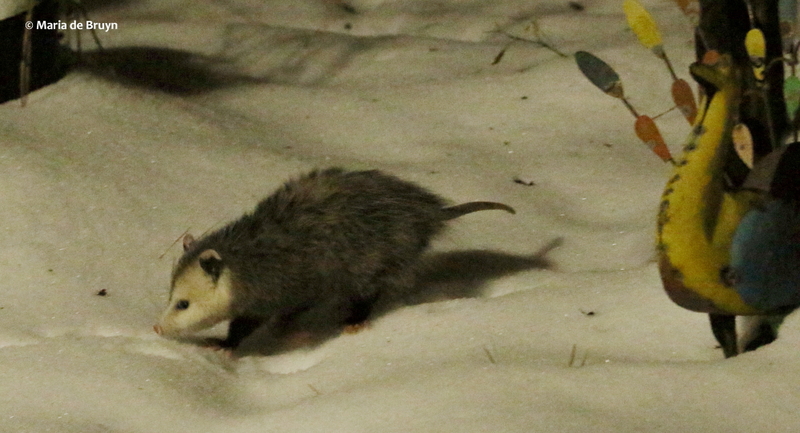 When I get to see an opossum (Didelphis virginiana) – like one who visited the yard at night during our early December snowstorm, it was a treat. 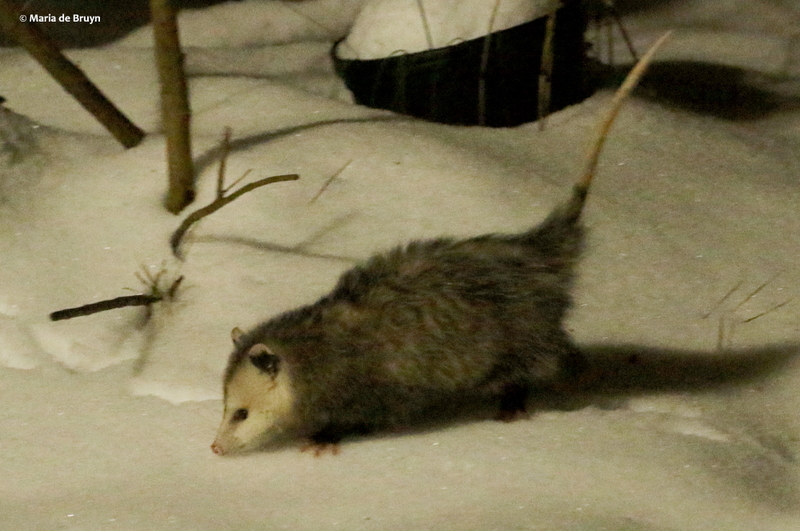 It seems many people dislike North Carolina’s state marsupial (and the only marsupial in North America) but it is a valuable neighbor since it eats up to 4000 ticks a week. 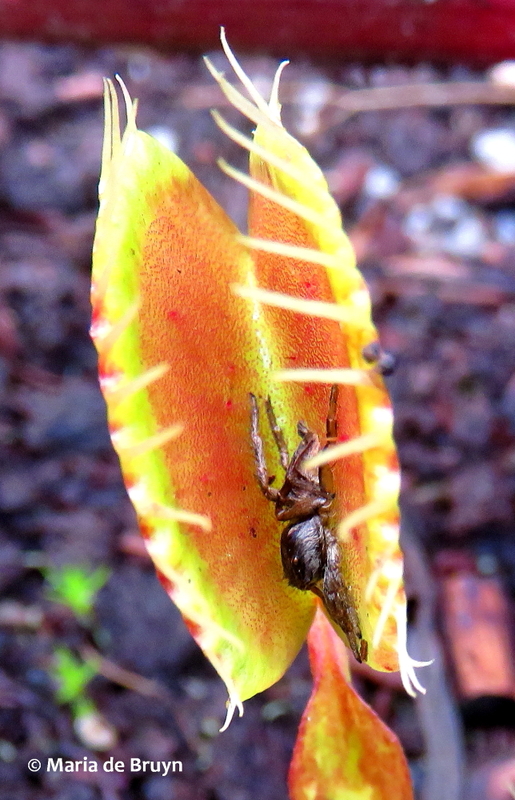 There likely weren’t many ticks around for it to eat but I hope it found something for a meal! 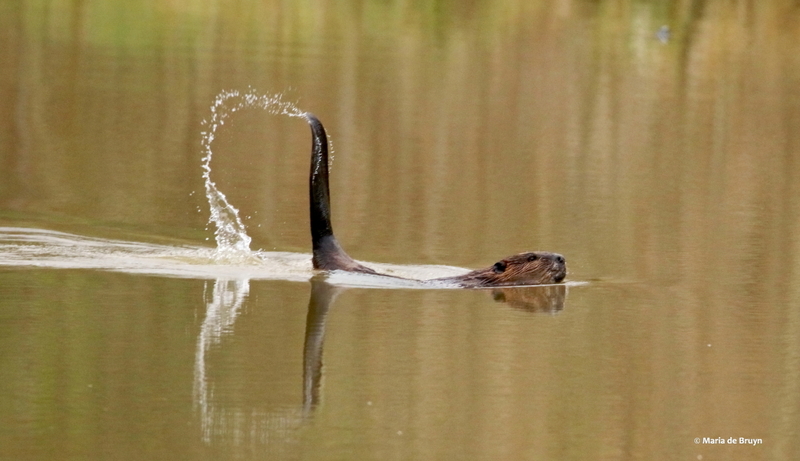 This past year was my “year of the beavers” as I had a chance to follow these nature landscape architects in three different places. 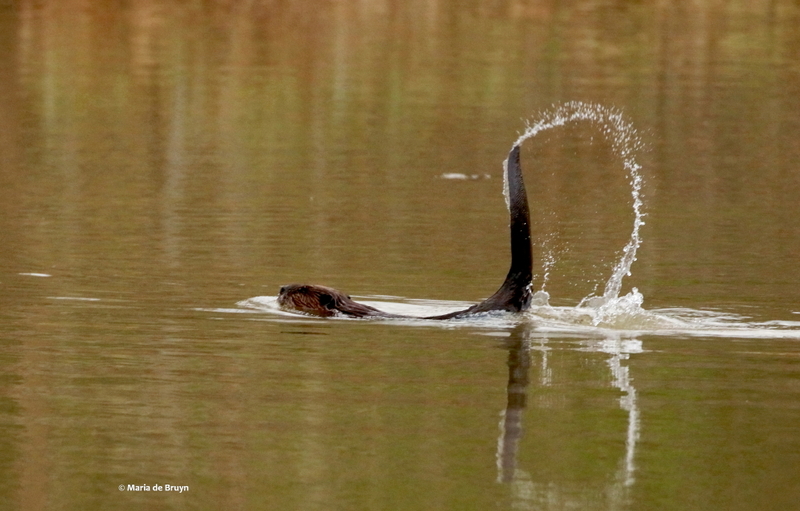 And as mentioned in a previous blog, I was so thrilled to get a shot of the warning tail-slapping behavior. 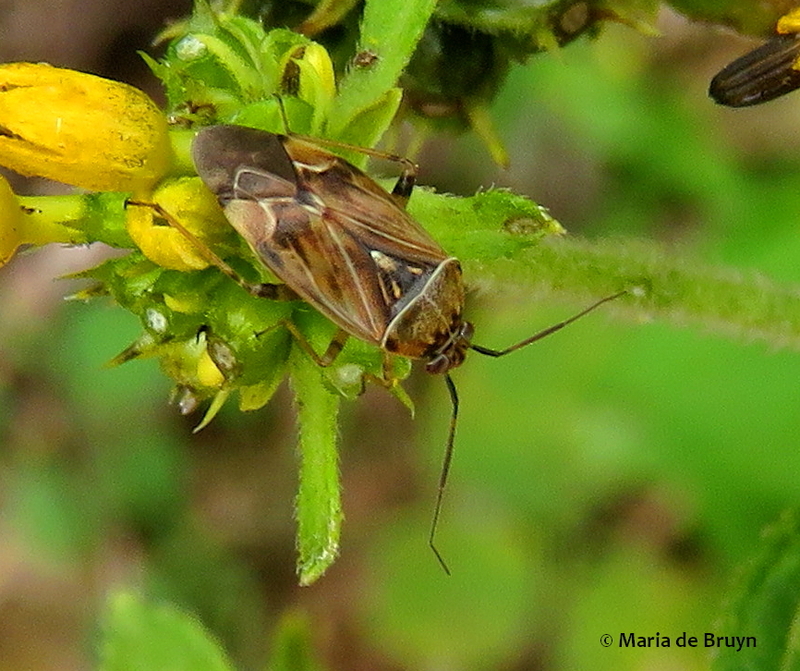 2018 was a good year for seeing new insects. 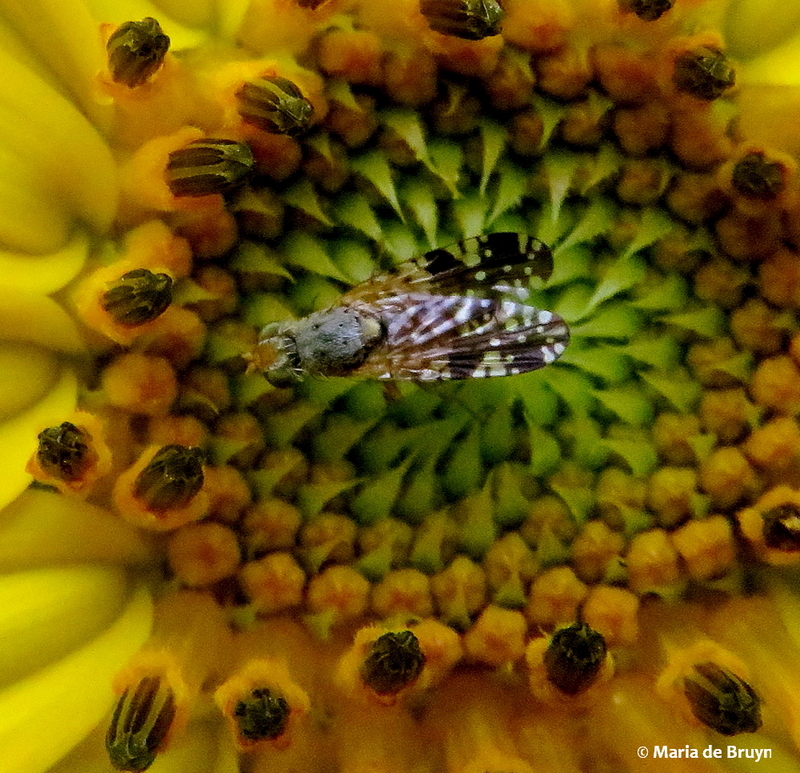 Some are so tiny that you can’t really see their body patterns without magnification. 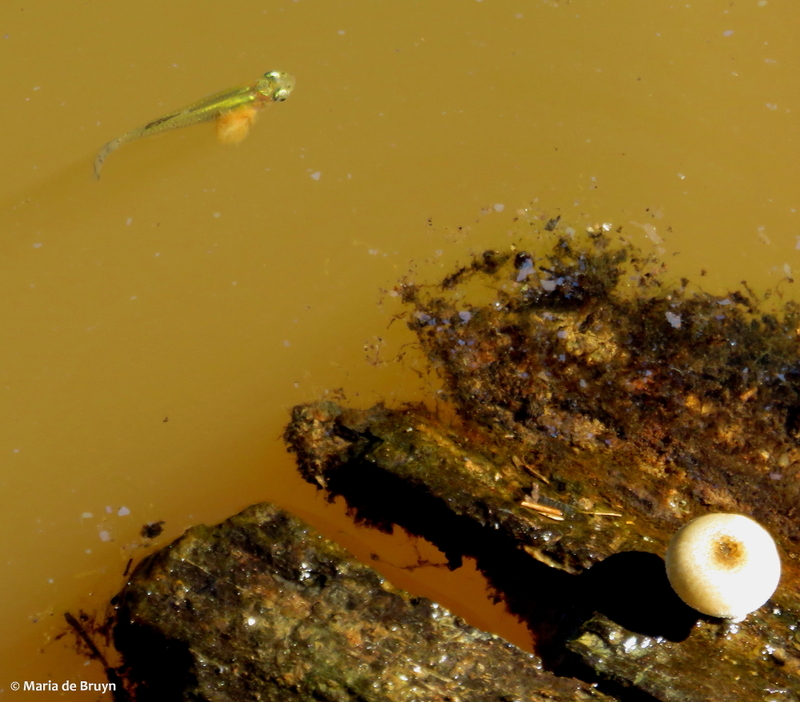 Here are a few of my “discoveries”. 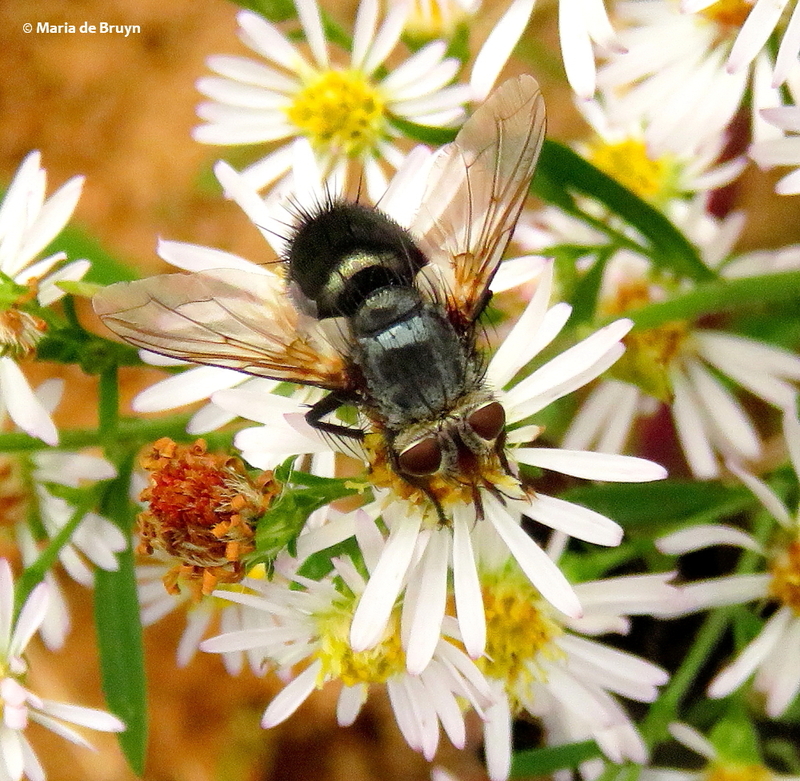 The flies can be very interesting. 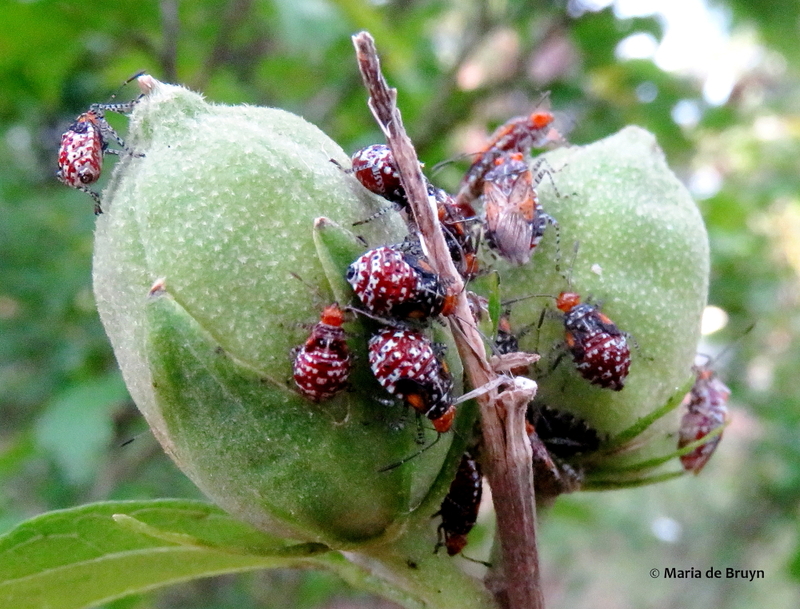 2018 was a year for learning about reproduction among the bugs; not only did I see caterpillars but also chrysalids and arthropod parents caring for offspring. 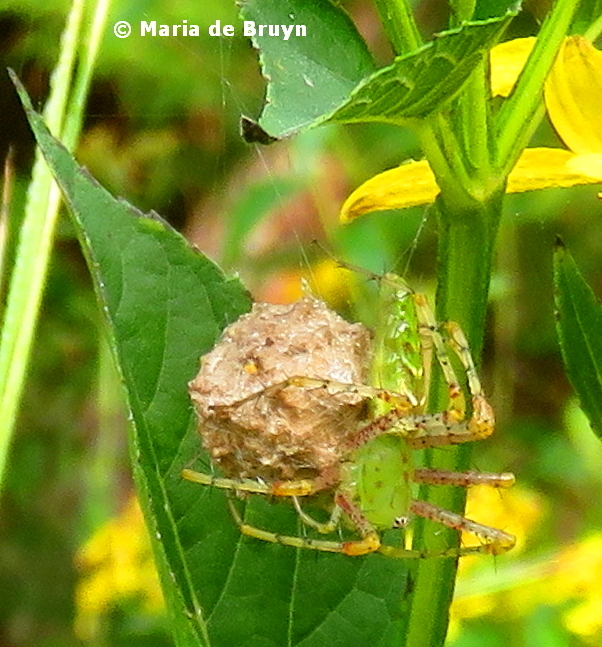 The green lynx spider (Peucetia viridans) is a very attentive mother; she often hangs her egg sac from a grass stalk and then encircles it with her body to keep predators away. 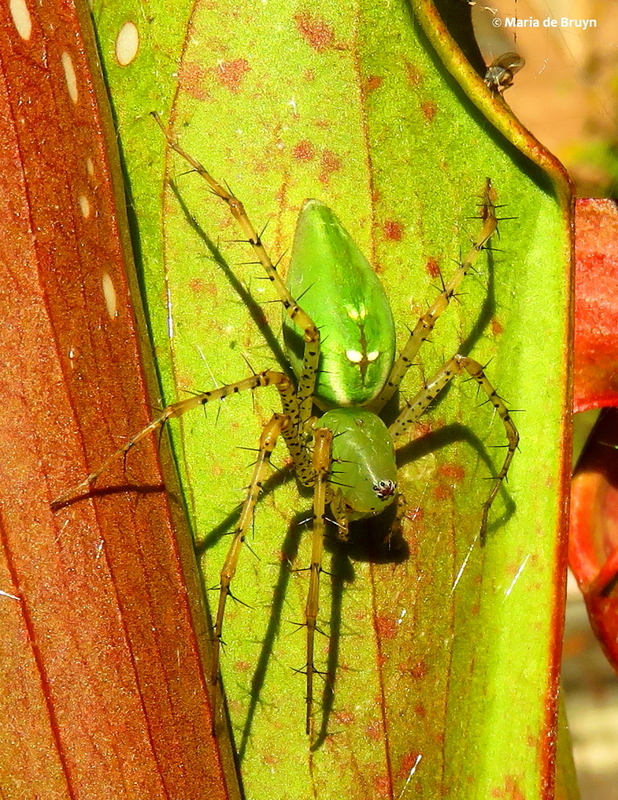 One green lynx at the NC Botanical Garden placed her egg sac underneath the “lid” of a pitcher plant and then hung out on that and neighboring plants to keep an eye on the sac. 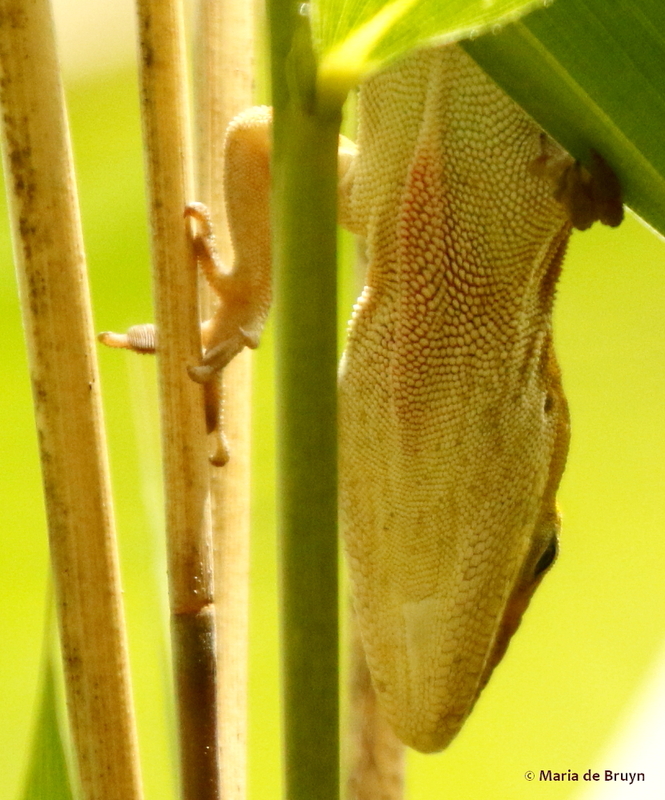 I was lucky to see one of the babies after it hatched. 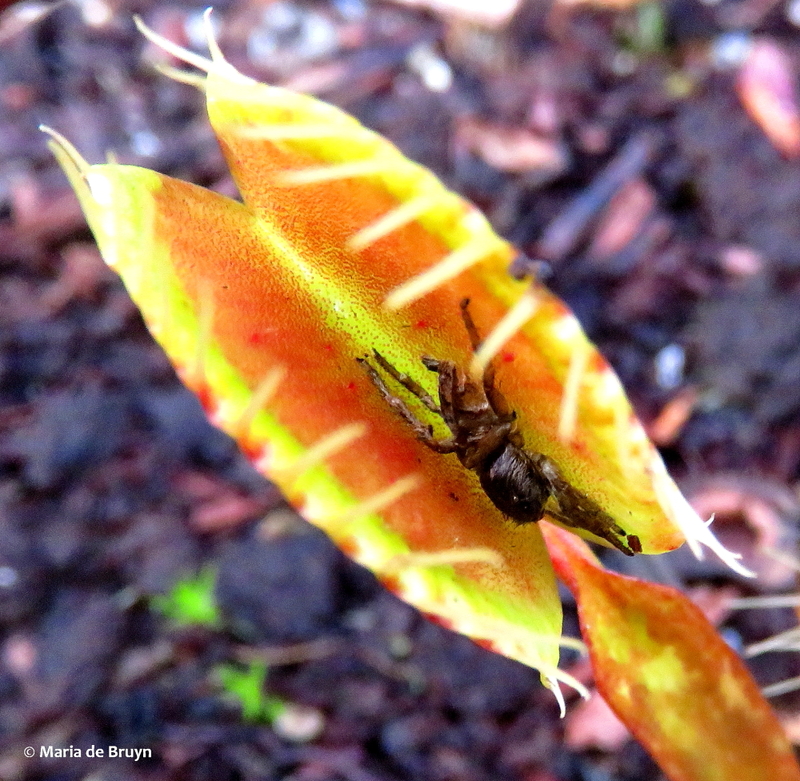 Another spider was not so lucky – it became a meal for one of North Carolina’s endemic “special plants”, the Venus flytrap (Dionaea muscipula). 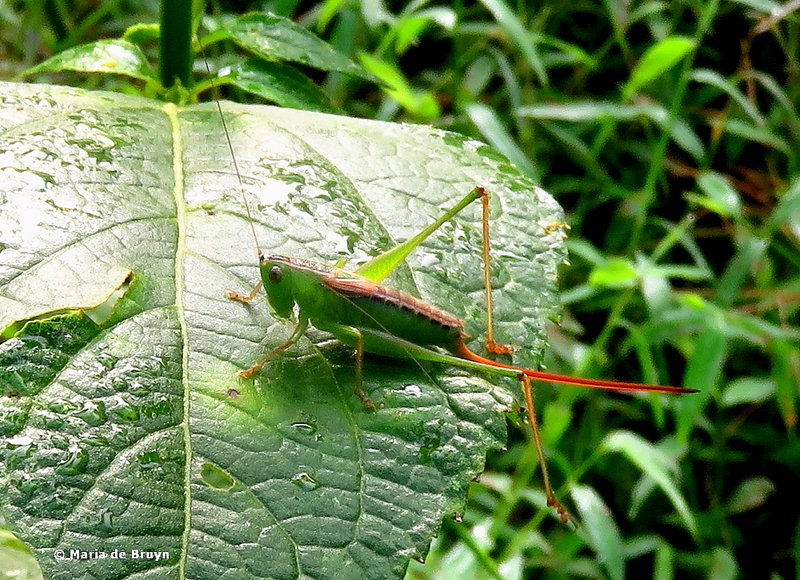 North Carolina has many species of grasshoppers; I saw several species this past year, including several mating pairs. 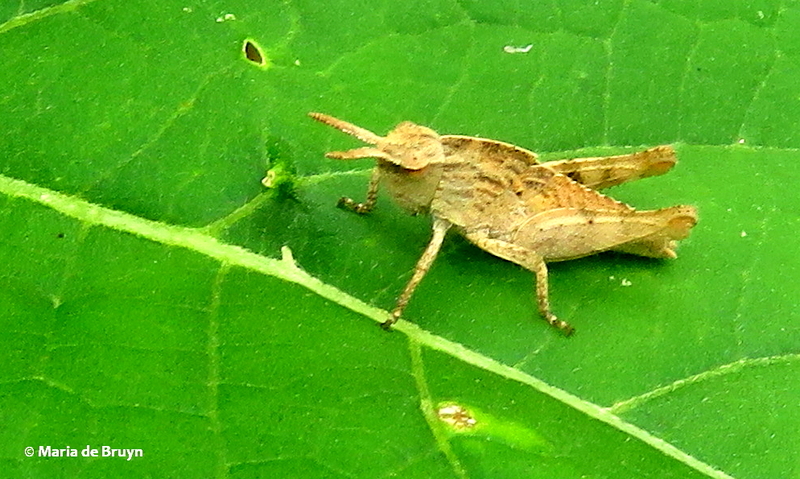 Here is a young short-horned grasshopper. 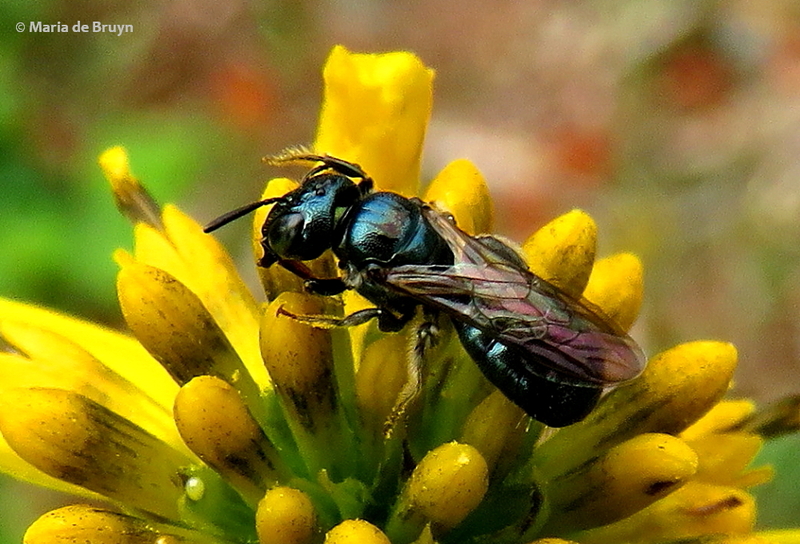 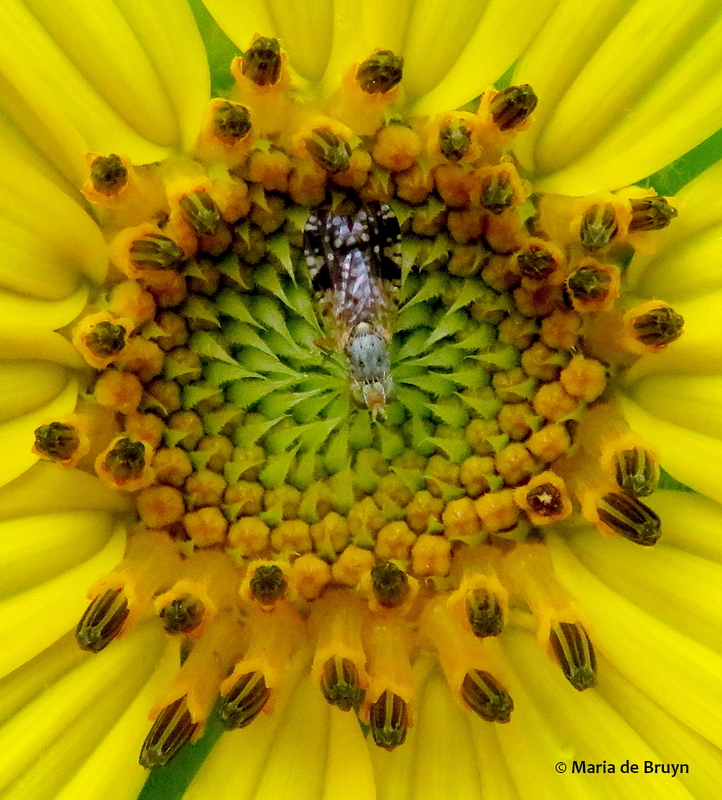 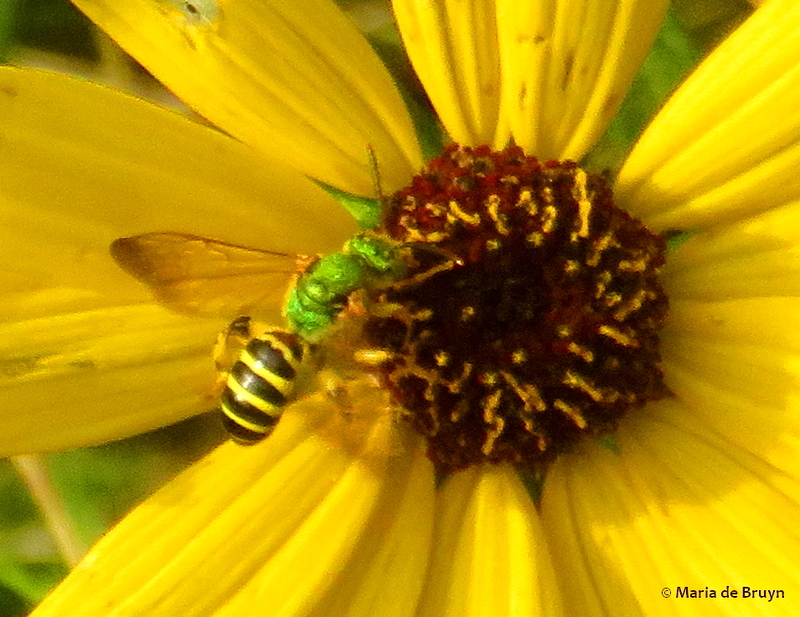 It’s always nice to see some pollinators. 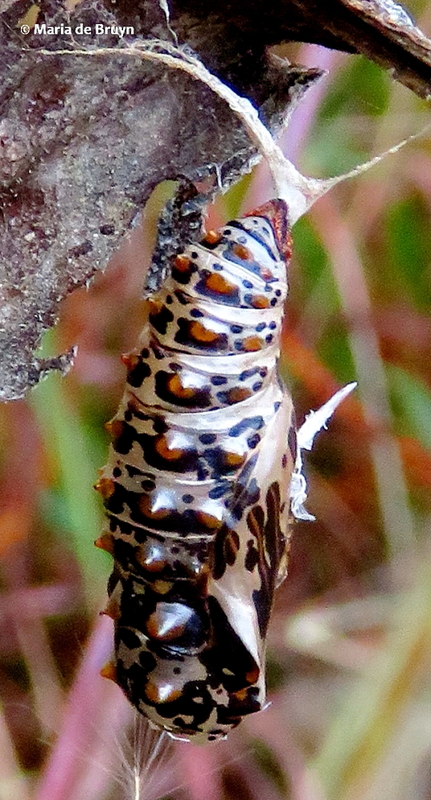 I got to see the chrysalids of two fritillary butterfly species, the variegated fritillary (Euptoieta Claudia, left) and the gulf fritillary (Agraulis vanilla, below). 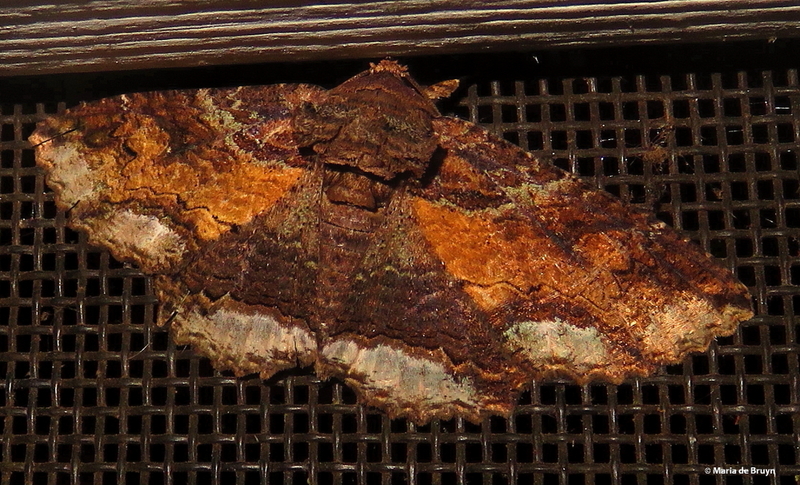 Sometimes, I think the moths get a bum rap, being seen as poor cousins to the “beautiful butterflies”. 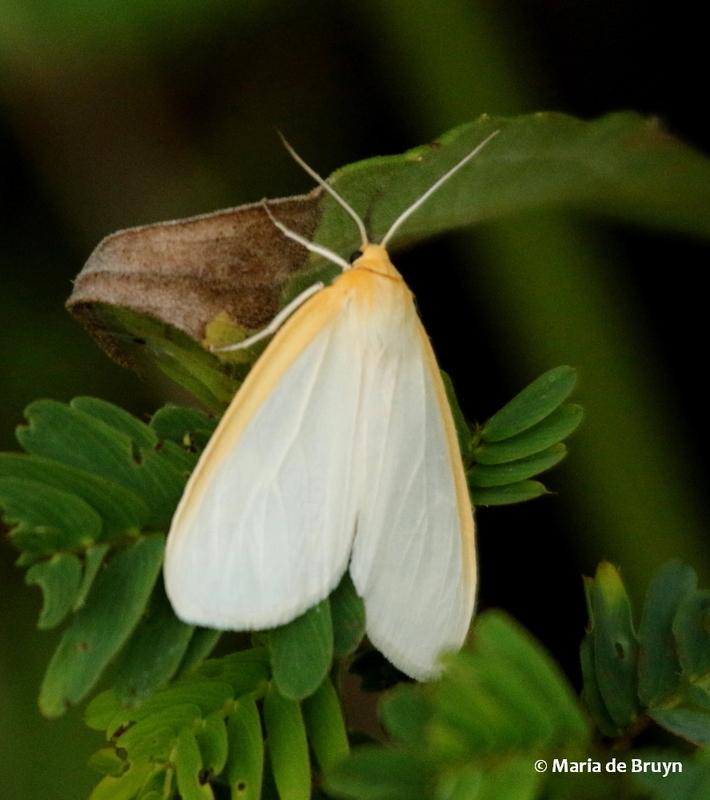 But there are many really beautiful moths, like the lunate zale moth (Zale lunata) and delicate cycnia moth (Cycnia tenera). 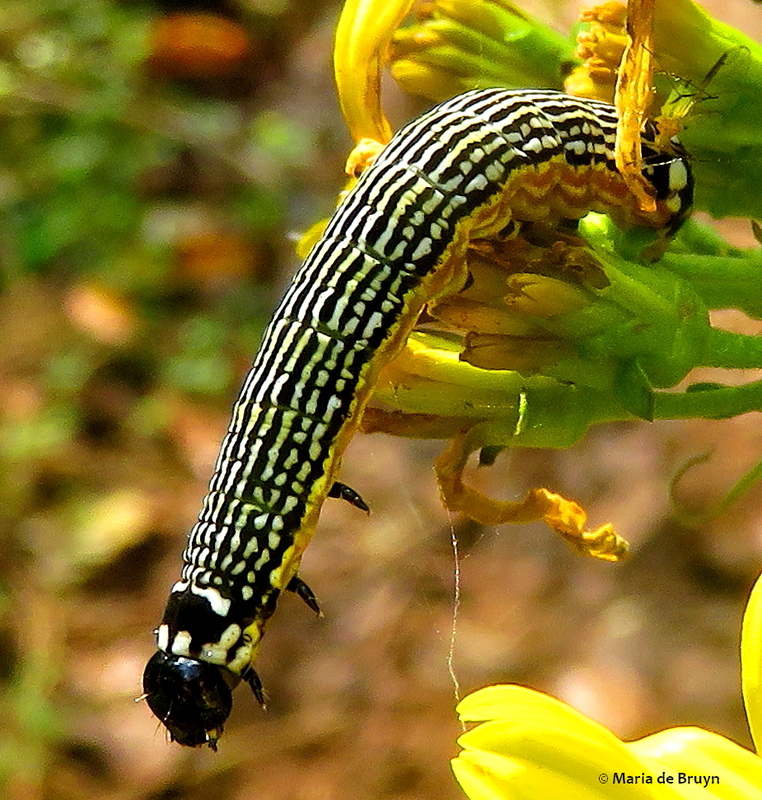 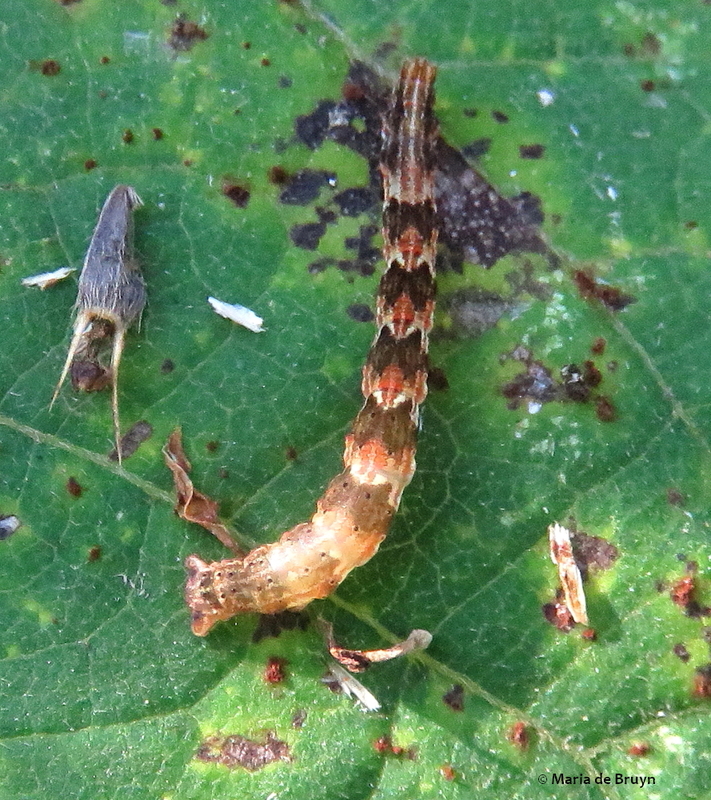 I got to see several moth caterpillars this year; the experts at BugGuide were very helpful in identifying them for me. 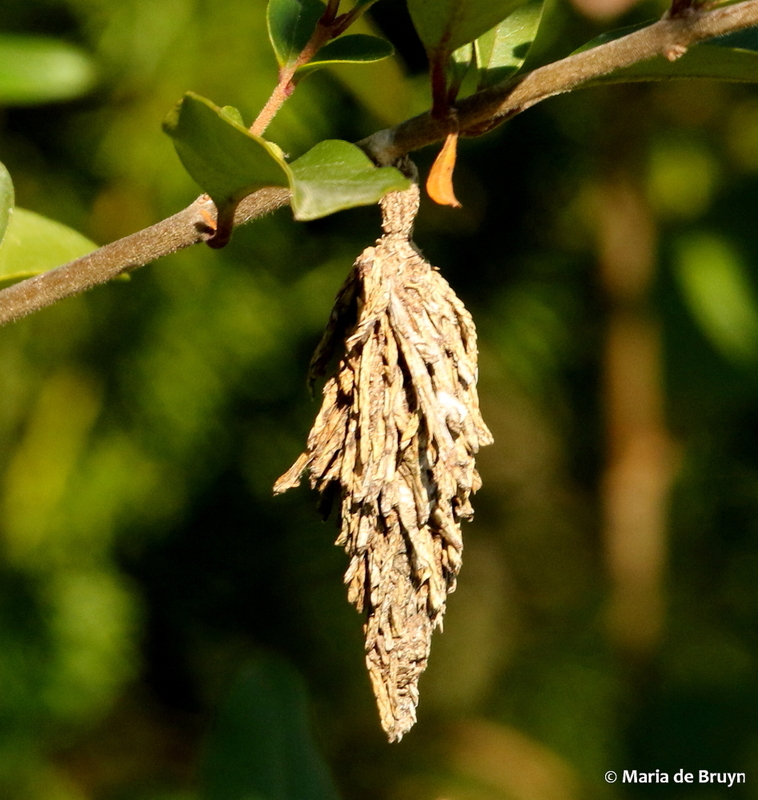 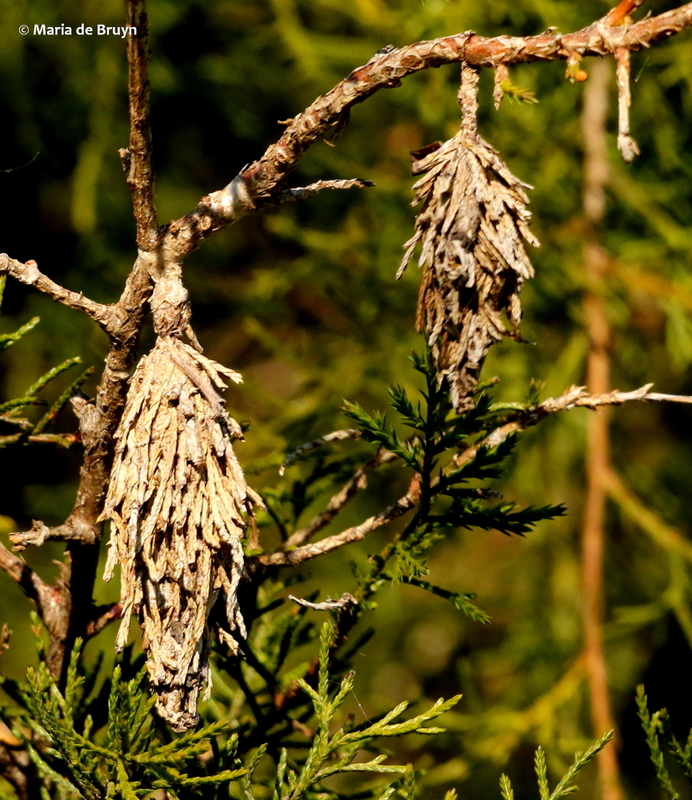 For the first time, I got to see an evergreen bagworm moth (Thyridopteryx ephemeraeformis). 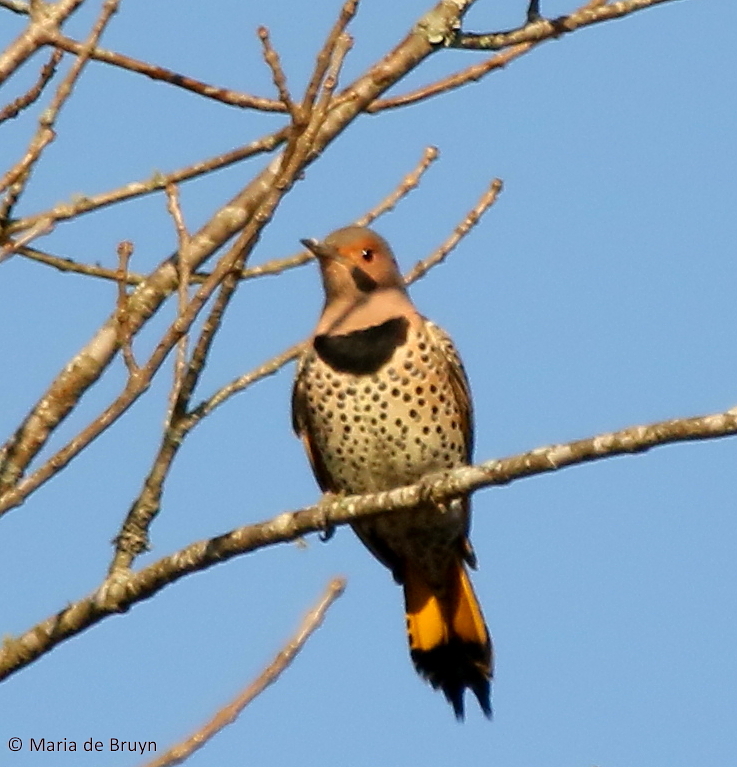 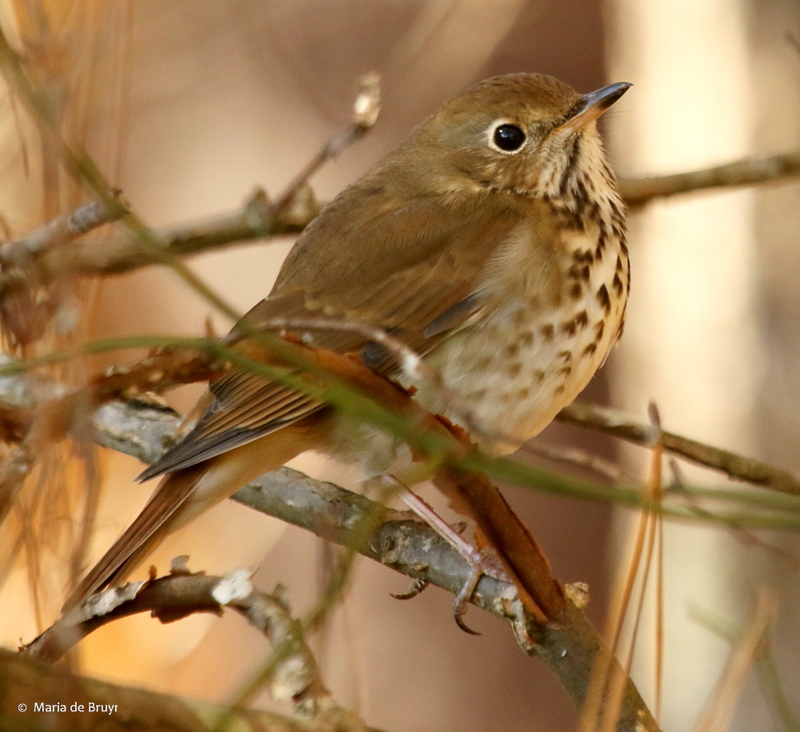 There were several hanging out in trees next to a rural farm pond – they did not restrict themselves to an evergreen tree but hung themselves from a persimmon, privet and cedar tree. 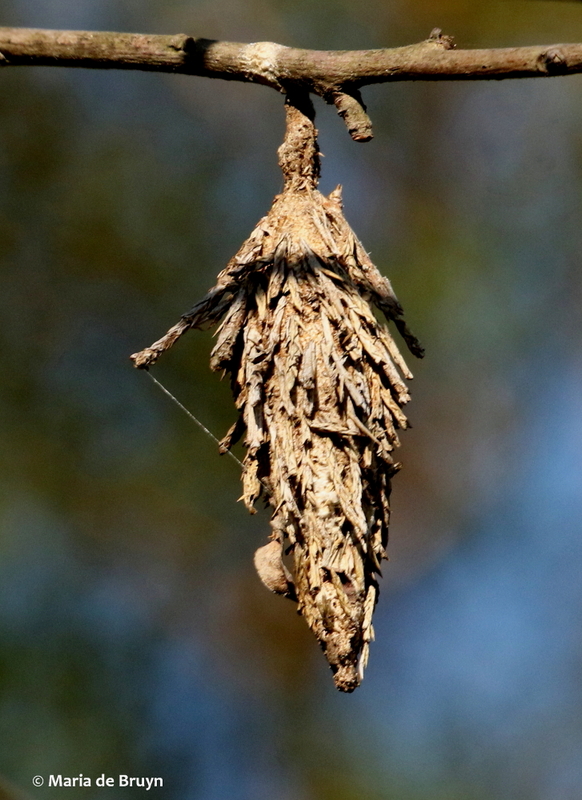 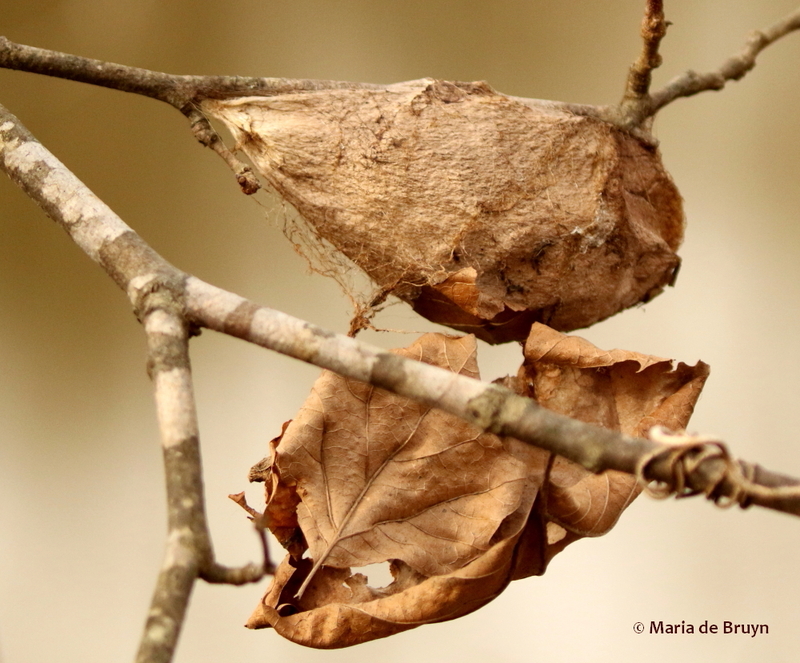 I think the last photo shows the caterpillar as it was completing the “bag” into which it would insert itself. 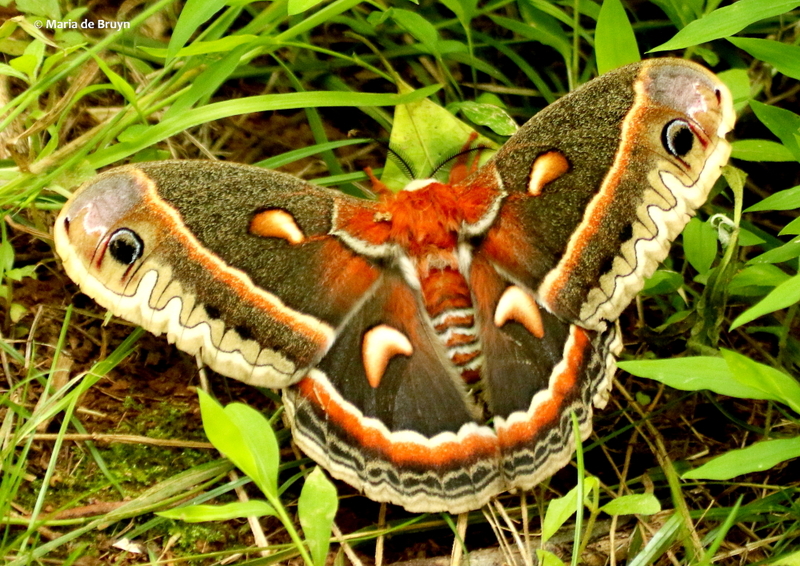 In the summer, I was lucky to see a cecropia moth (Hyalophora cecropia). 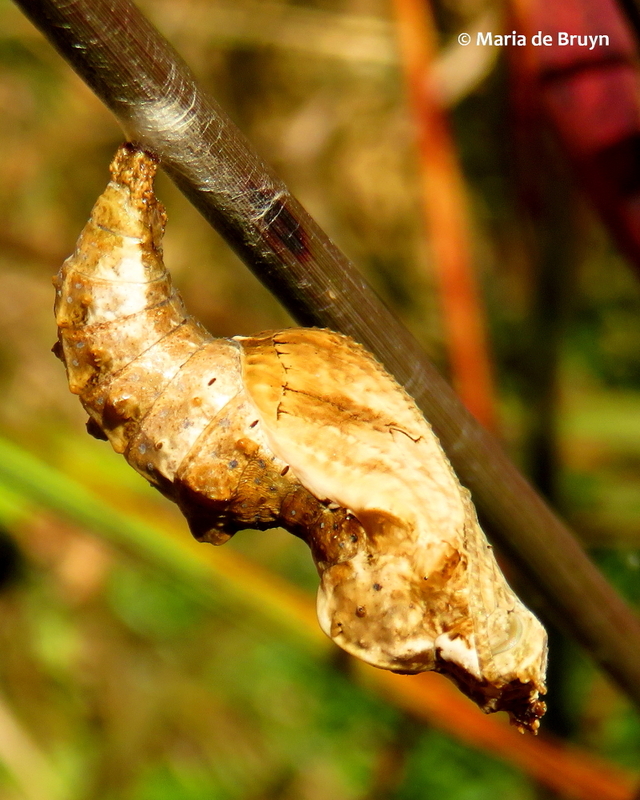 In December, I discovered two cecropia chrysalids, as well as the cup-like chrysalis of a polyphemus moth (Antheraea Polyphemus, which was empty). 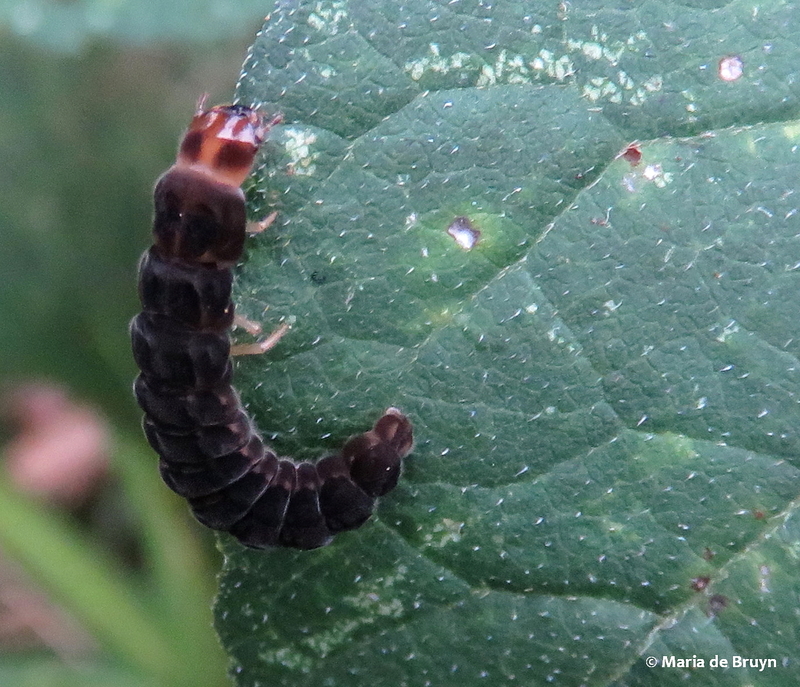 Another discovery was that the larvae of soldier beetles look like some type of caterpillar as well. 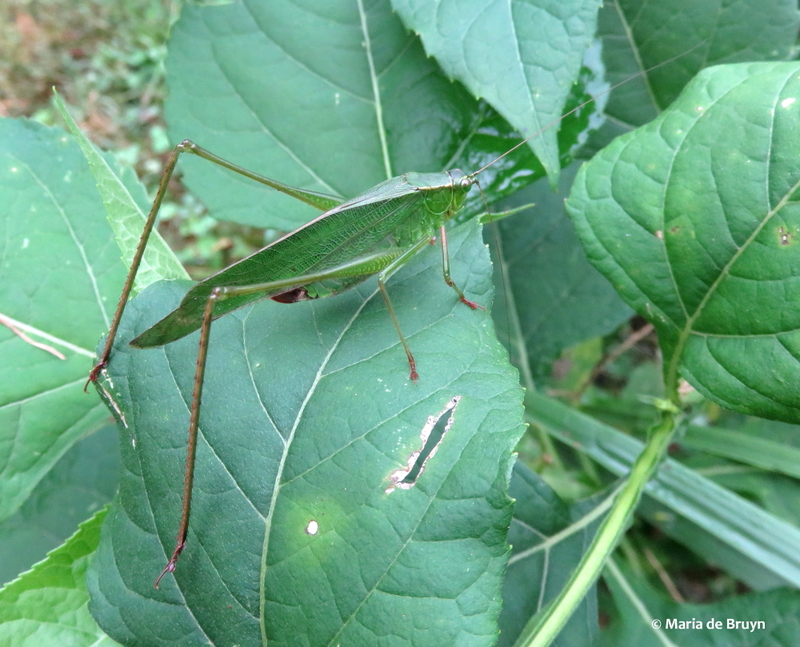 There were lots of katydids around, including the slender straight-lanced katydid (Conocephalus strictus) and the stockier Scudderia bush katydid. 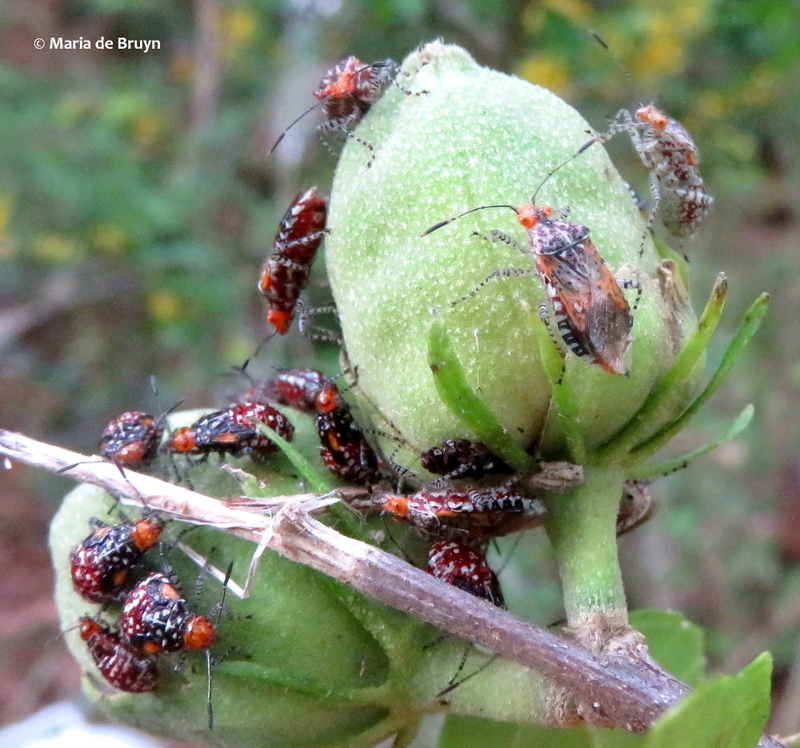 Some new bugs appeared in my yard, including a plant bug with muted colors (not yet identified to species) and some more colorful scentless plant bugs (Niesthrea louisianica) on my Rose of Sharon shrubs. 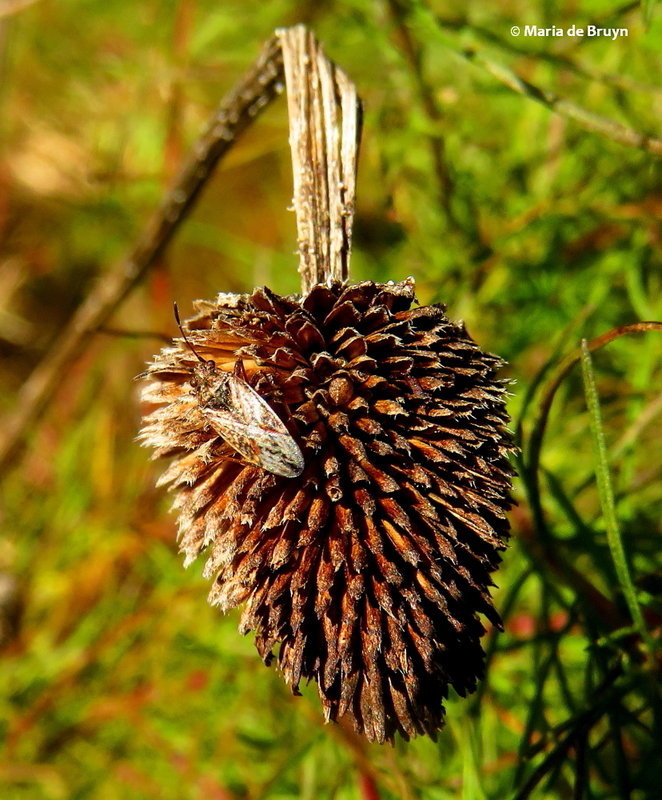 A seed bug on a seed pod and a head-on photo of a millipede (Narceus americanus-annularis-complex) were cool sightings, too. 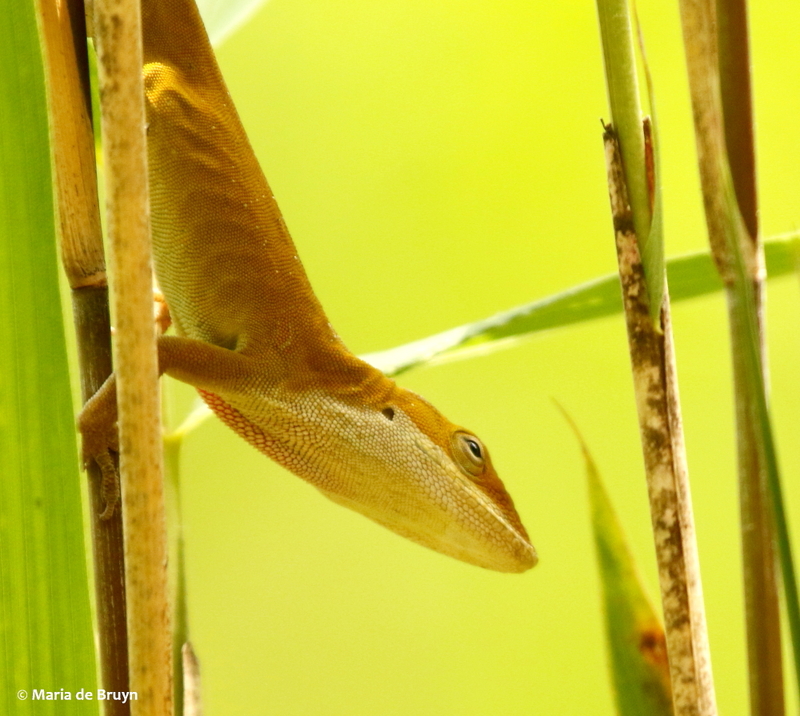 2018 was a good year for my observations of reptiles, too. 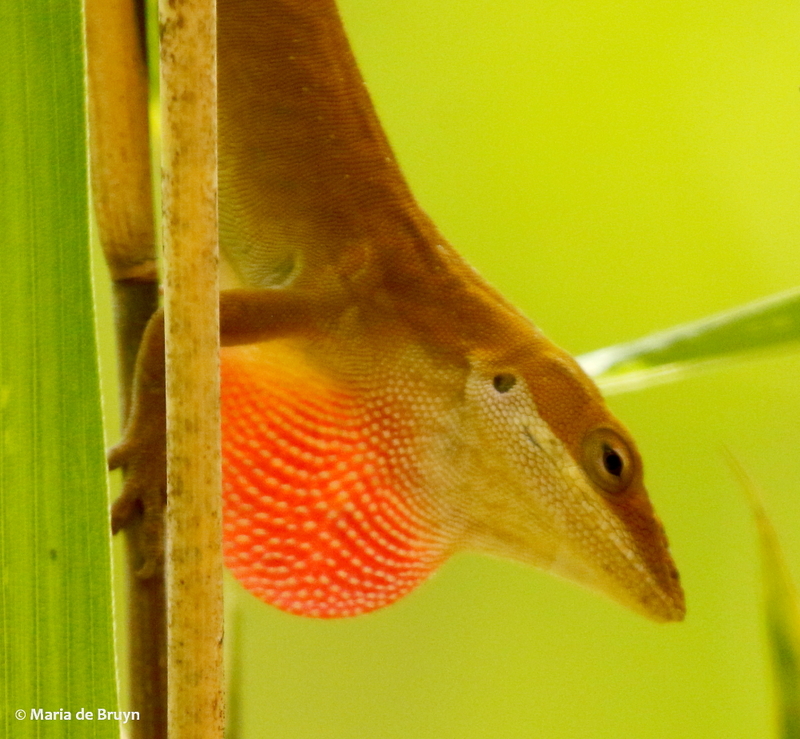 Seeing a Carolina anole (Anolis carolinensis) flash its red dewlap (also known as a throat fan) was not a new experience but the fact that it was only a foot away from me doing it was a surprise. 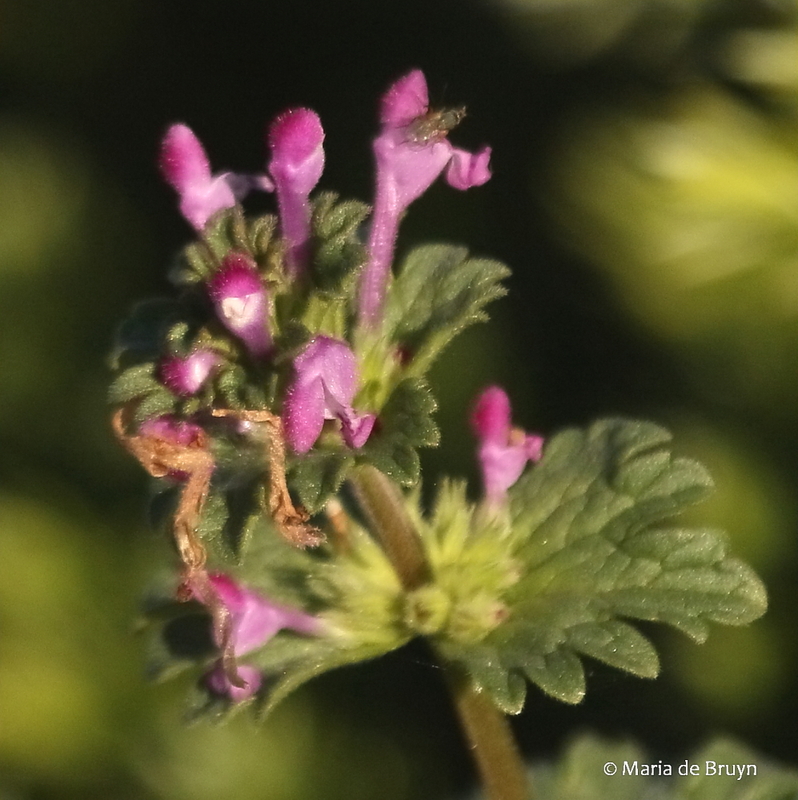 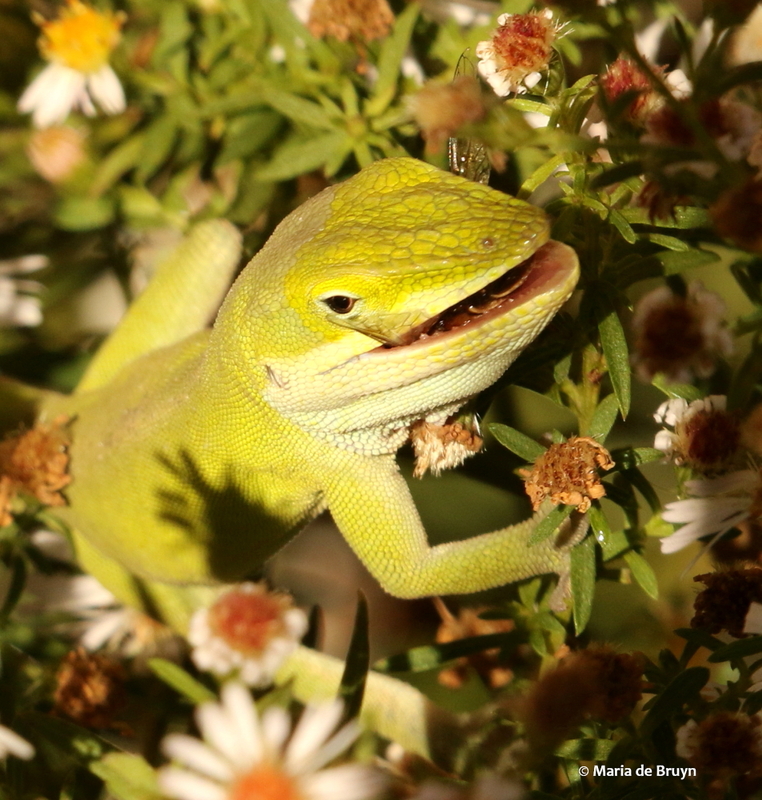 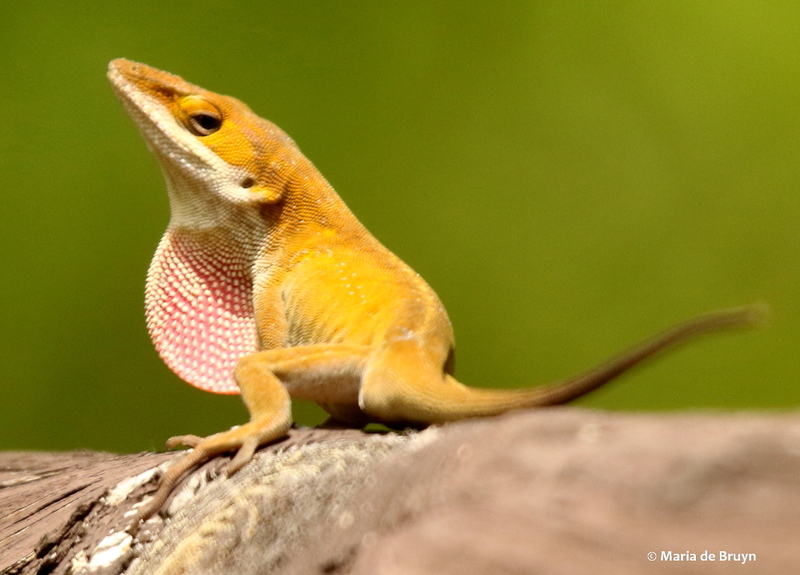 Seeing one of these anoles jump from one small flower twig to another in order to catch a bee for supper was a surprise – I didn’t know they eat bees. 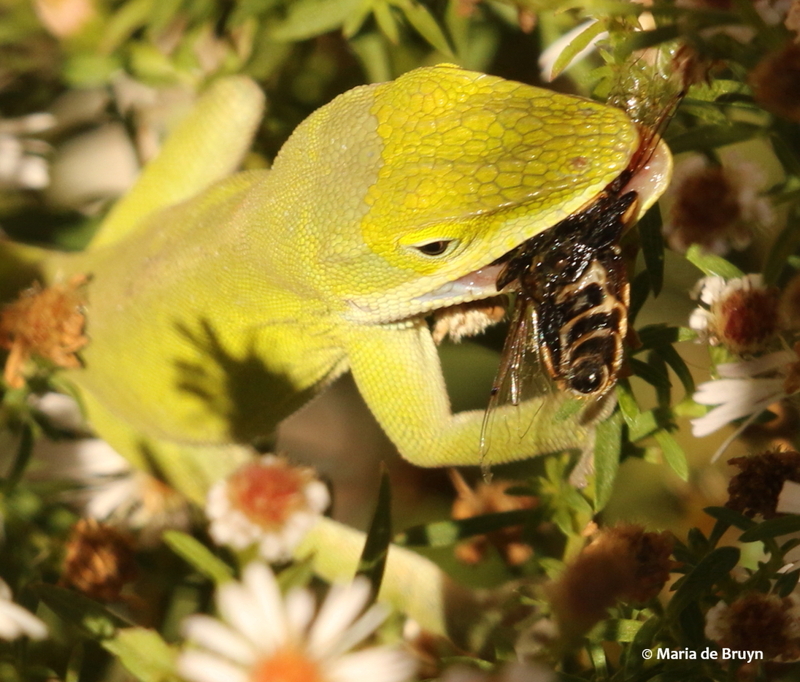 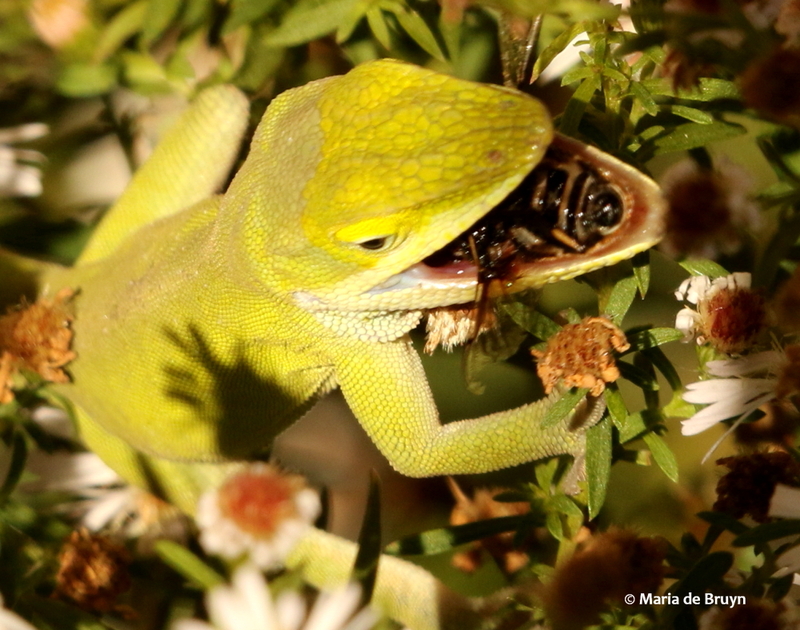 I felt a little sad that we lost a pollinator that way, but the anoles have to eat, too. 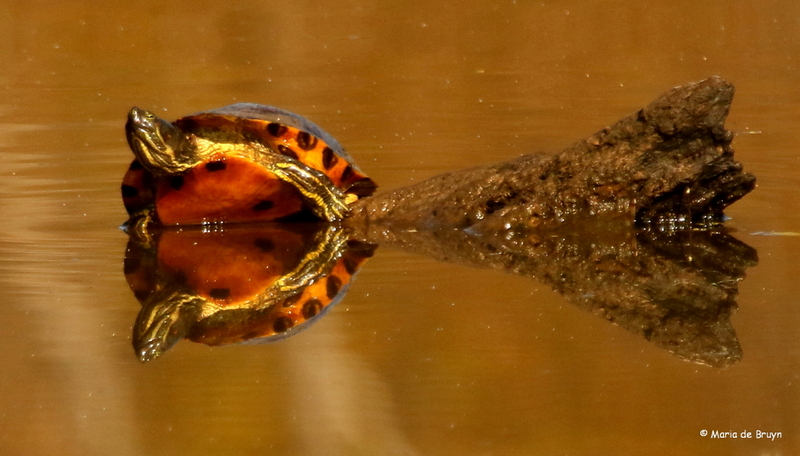 One day, when walking at the same wetlands where the anole hung out I came across some beautifully colored turtles. 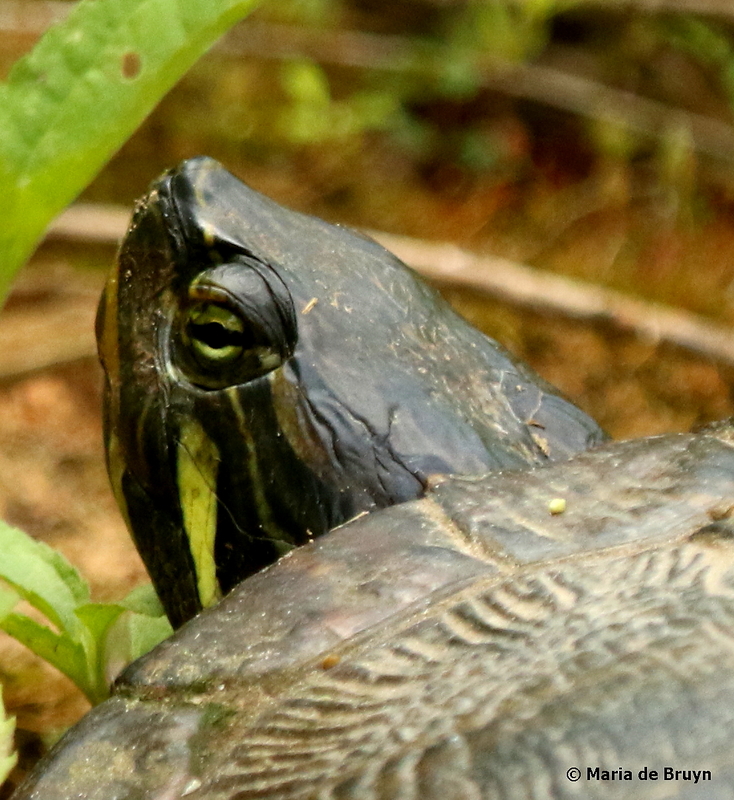 The yellow-bellied slider (Trachemys scripta) had a beautiful pattern on its face. 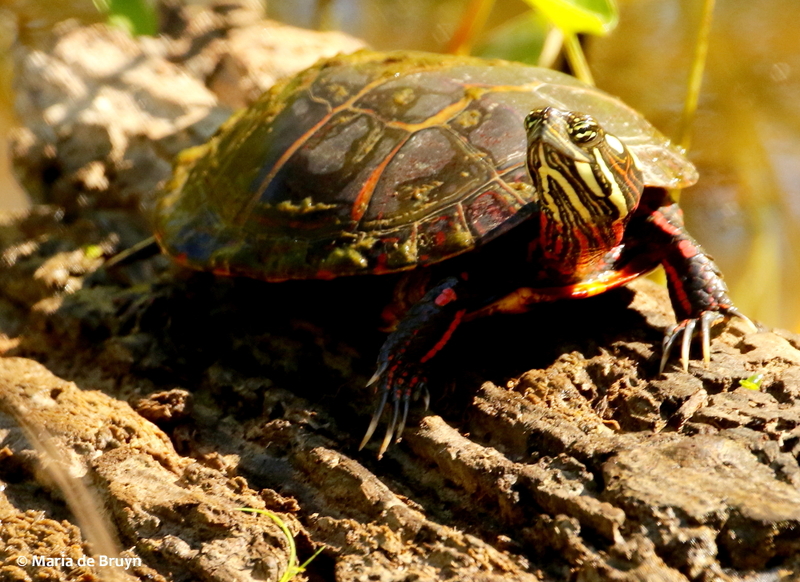 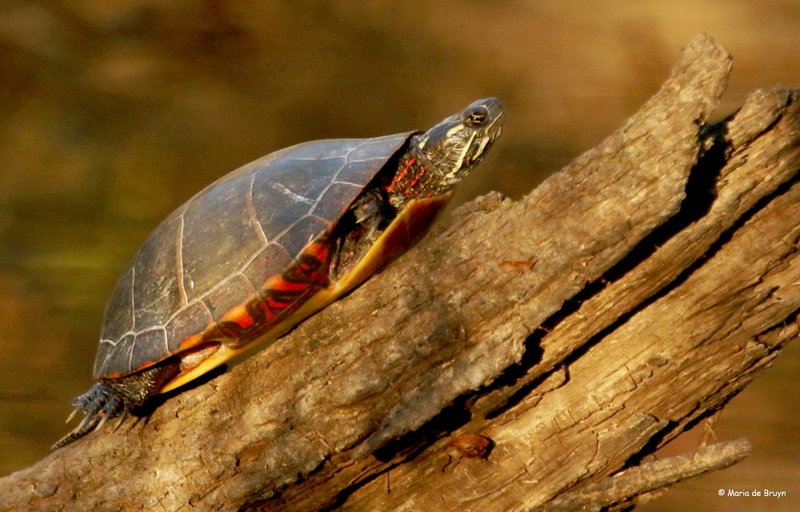 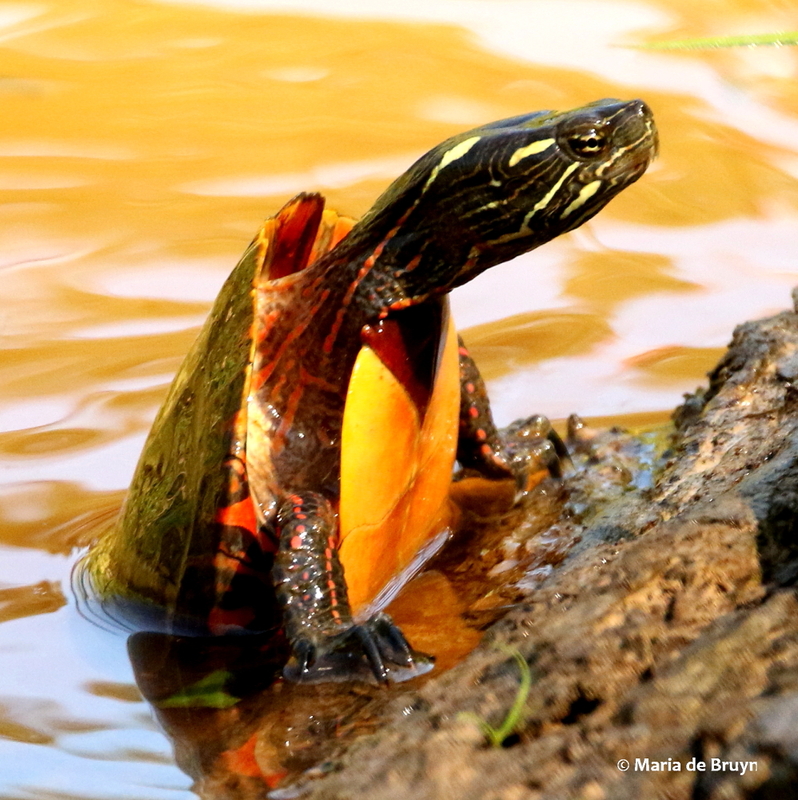 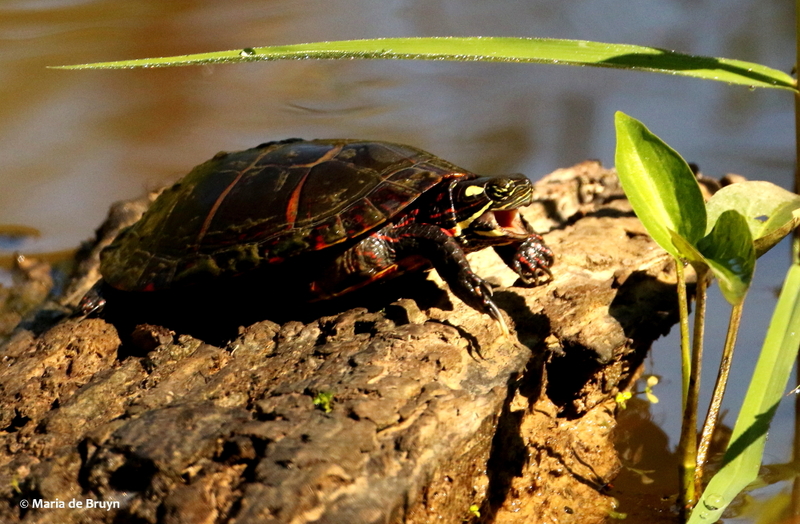 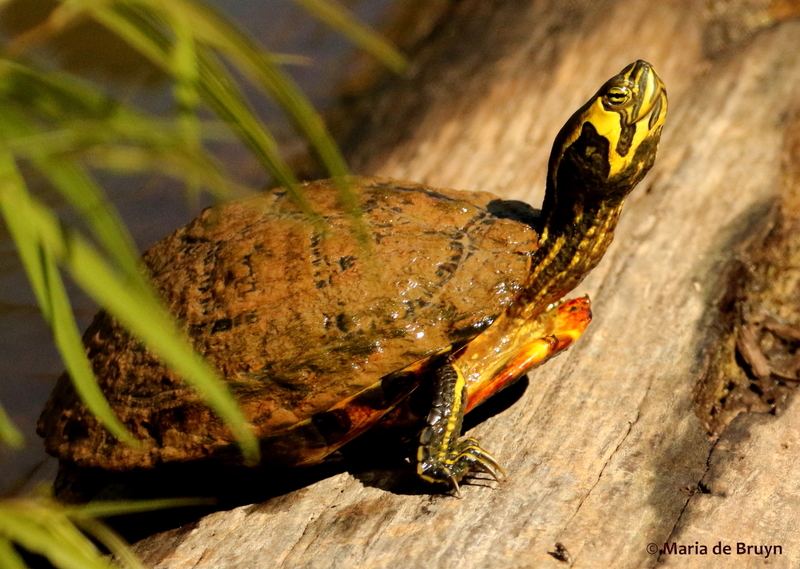 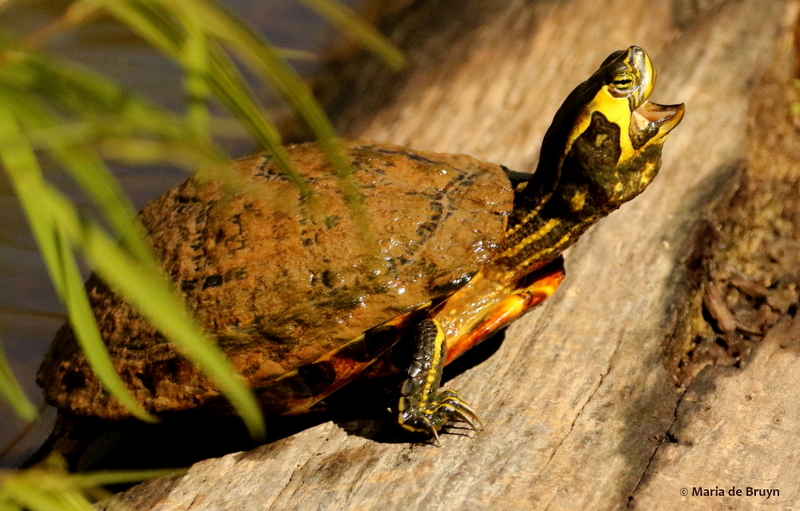 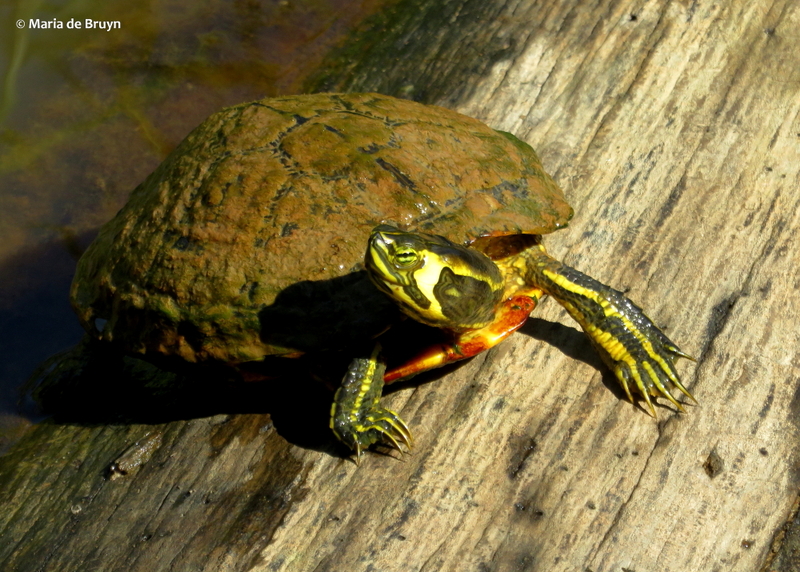 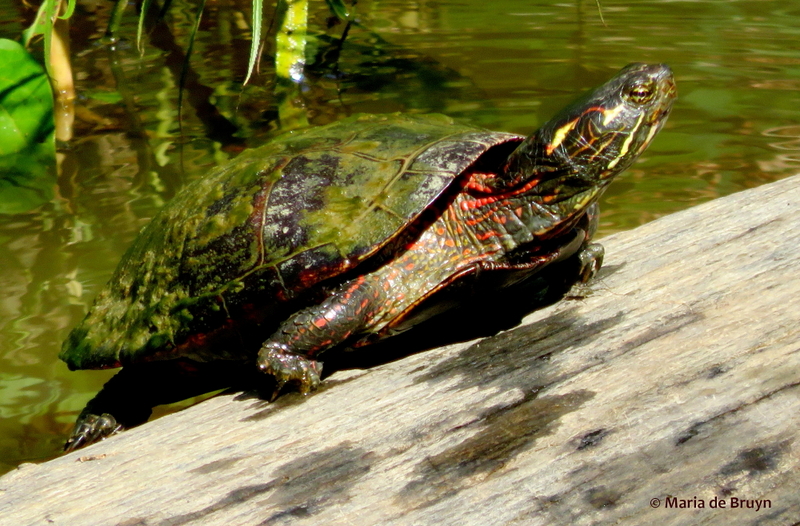 The painted turtle (Chrysemys picta picta) with its long claws had some beautiful bright red striping. 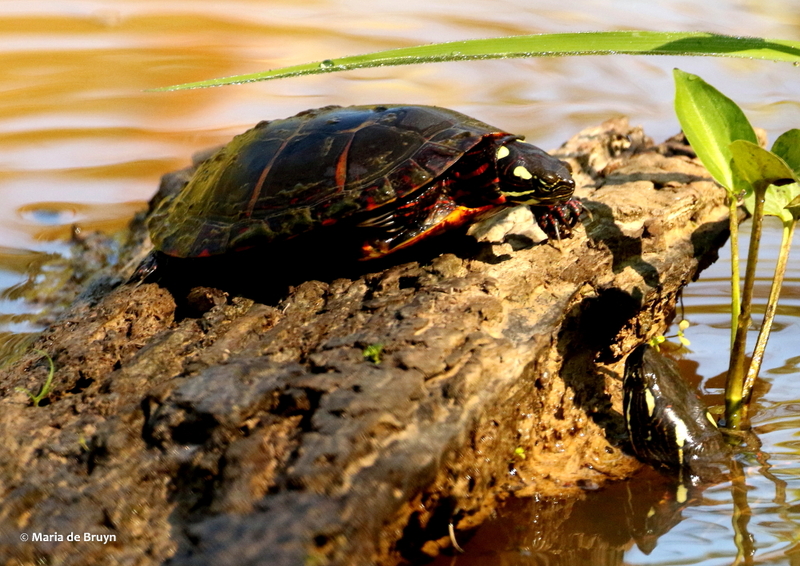 It had gotten a prime sunning spot on a log that another turtle wanted for itself; the first turtle held it off. 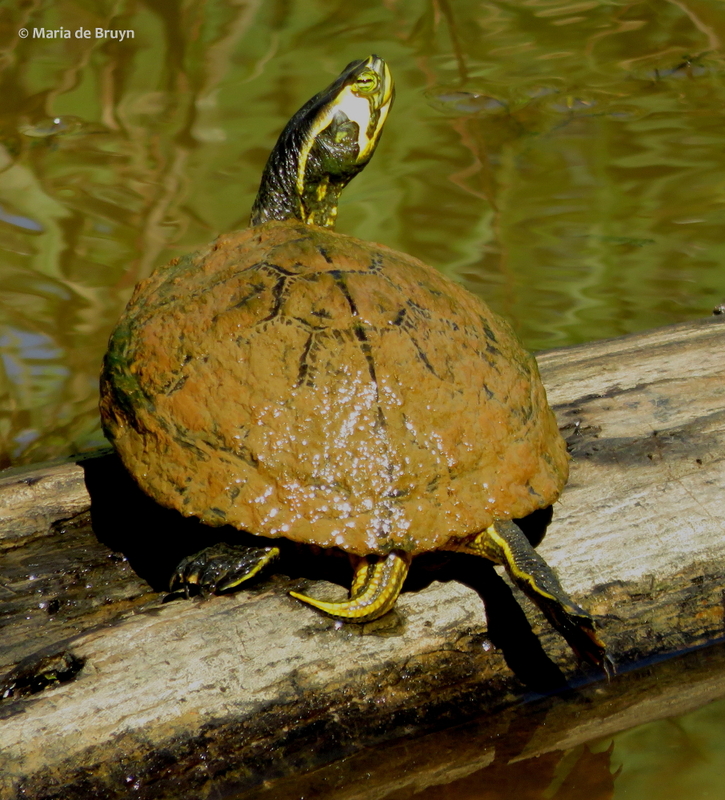 The second turtle circled around and tried to get on board from the other side but turtle No. 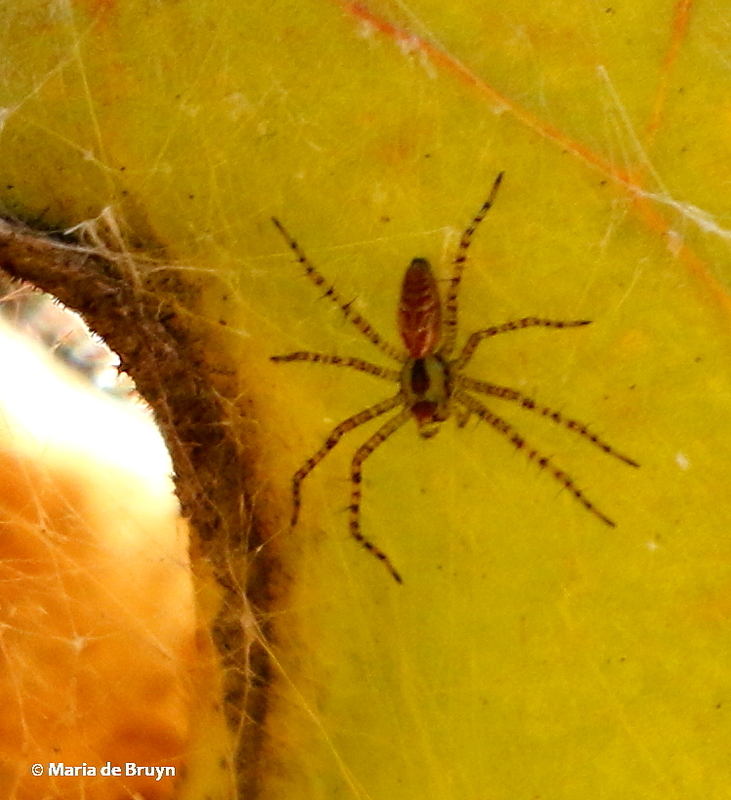 1 kept it at bay. 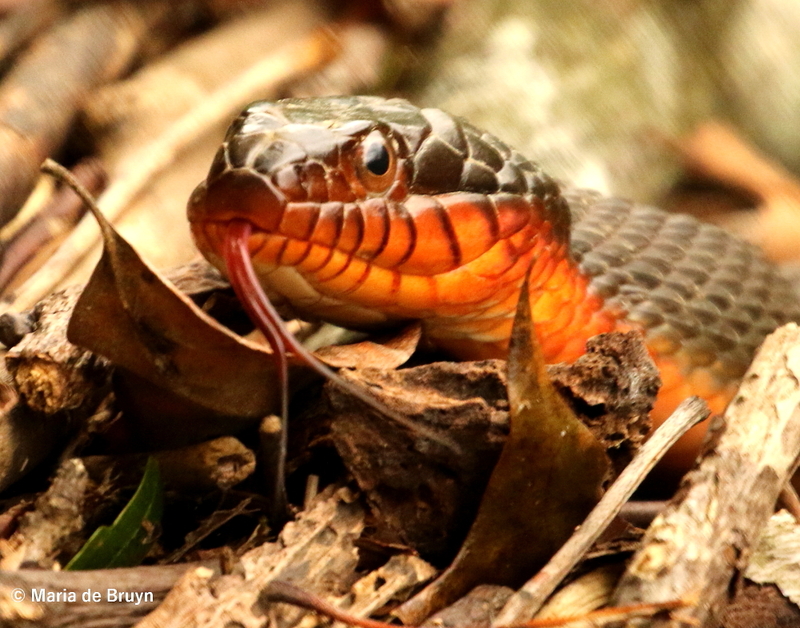 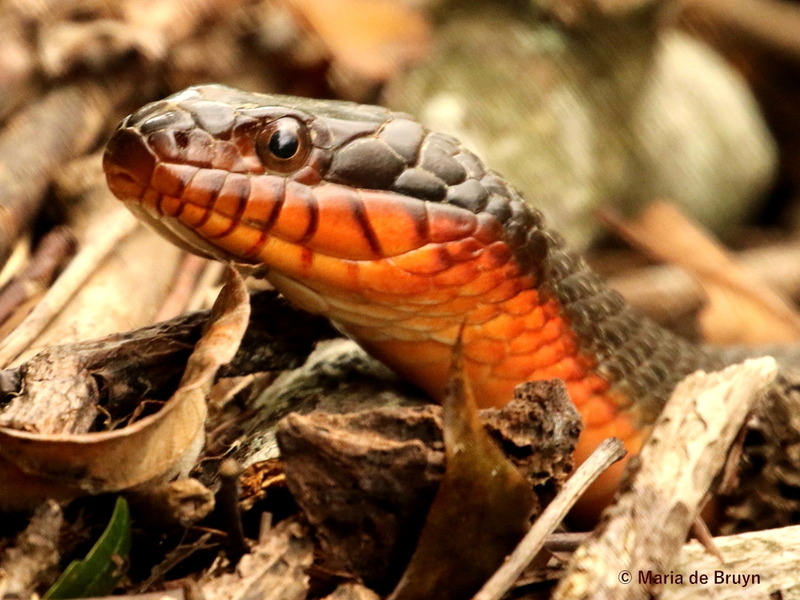 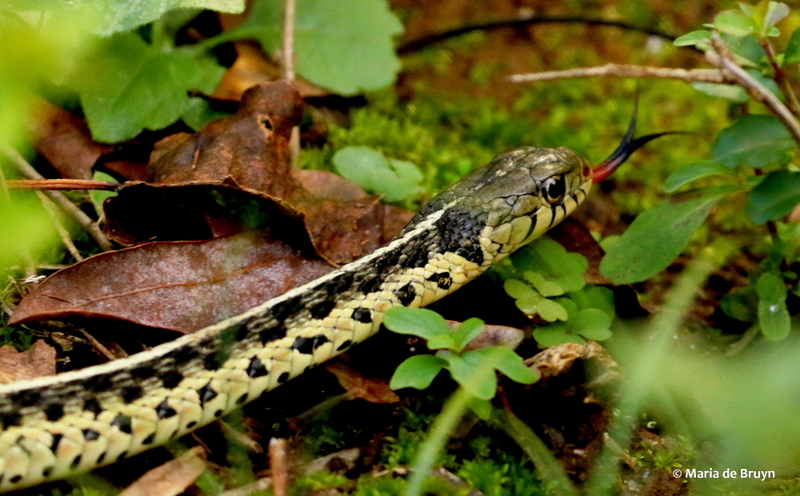 My snake encounters included seeing Northern water snakes and rat snakes. 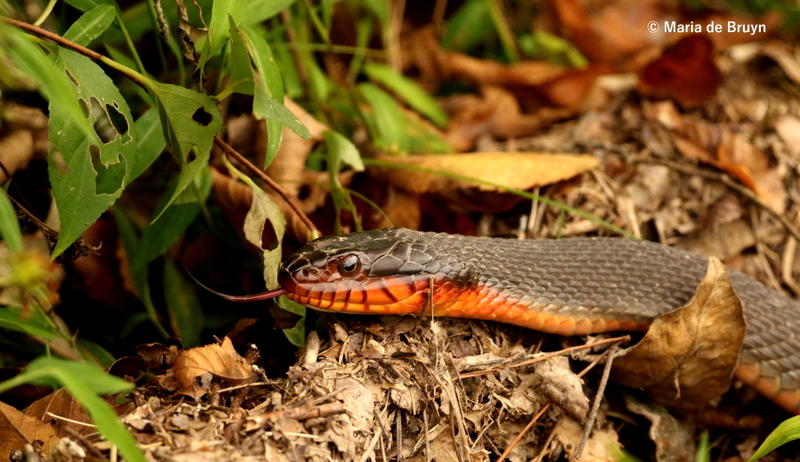 It was a beautiful red-bellied water snake (Nerodia erythrogaster) that caught me by surprise when it suddenly veered off its course toward me. 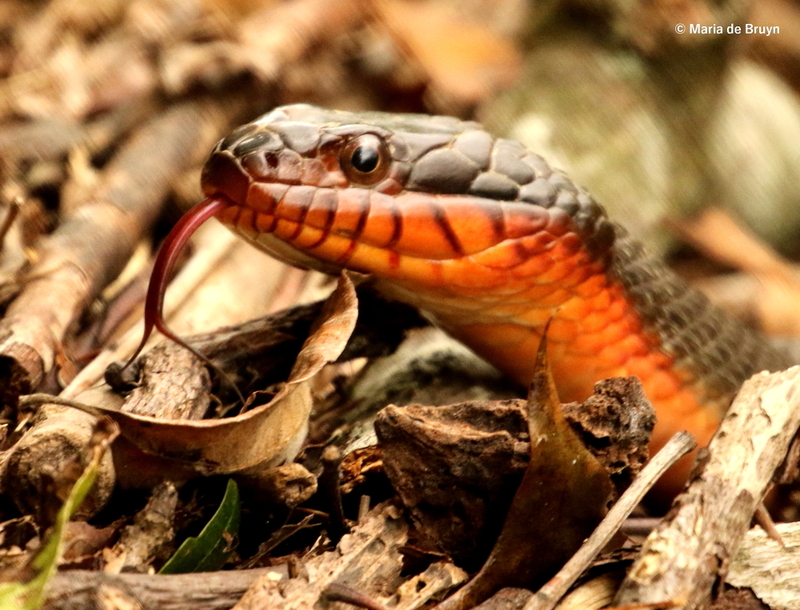 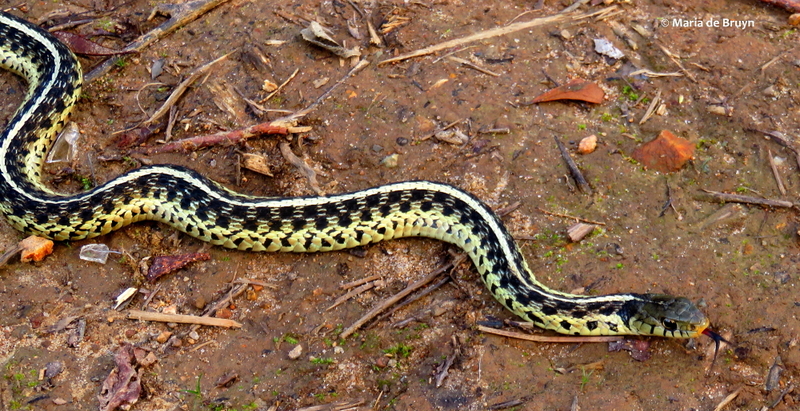 I backed up and the reptile stopped approaching, flicking its tongue out as it explored what was going on. 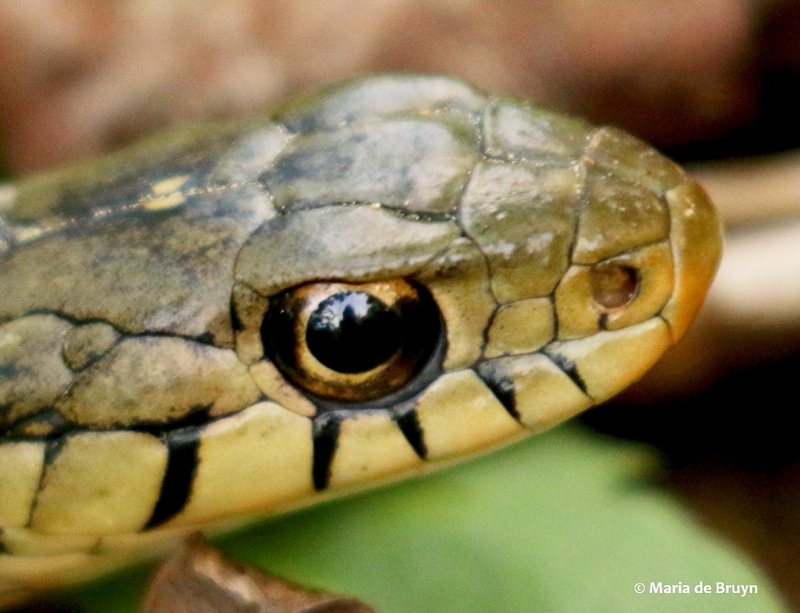 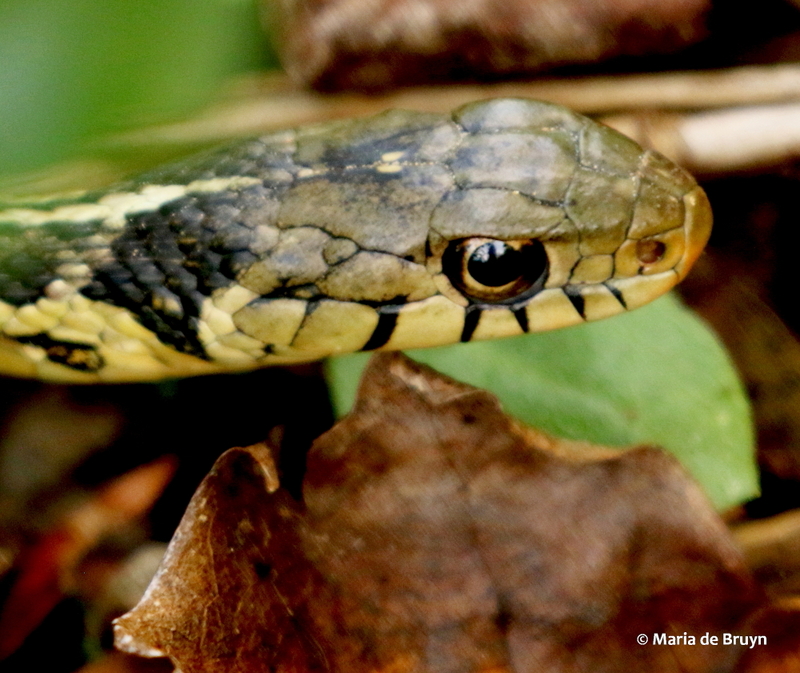 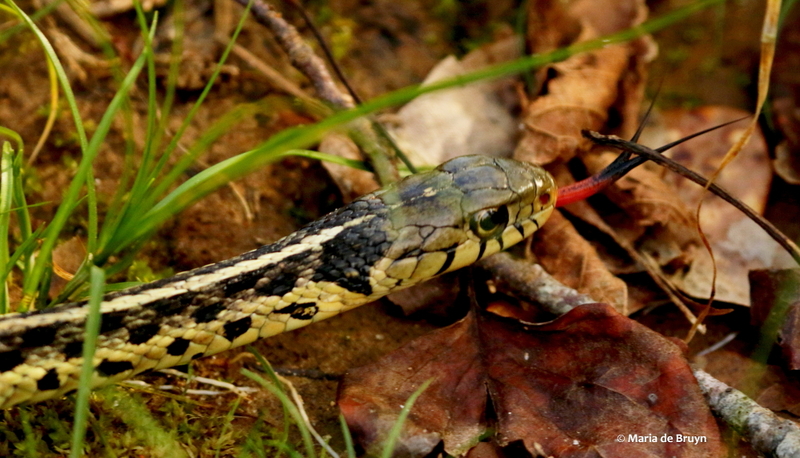 My final spotting to share with you today is another gorgeous snake – a common garter snake (Thamnophis sirtalis). 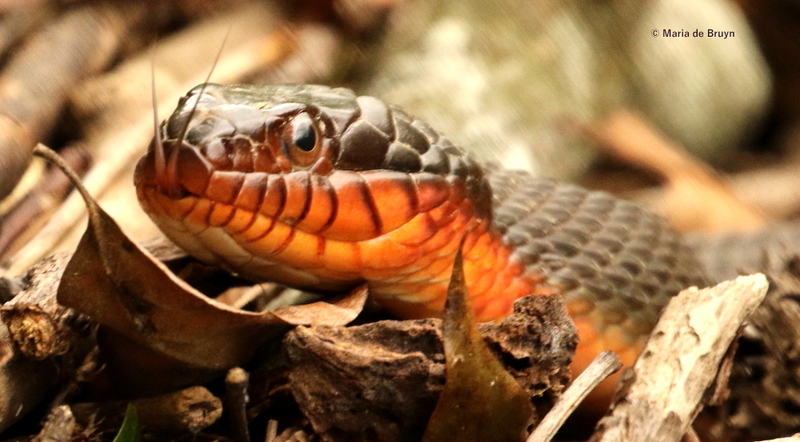 It had been a long time since I had encountered one and this individual had quite vivid colors. 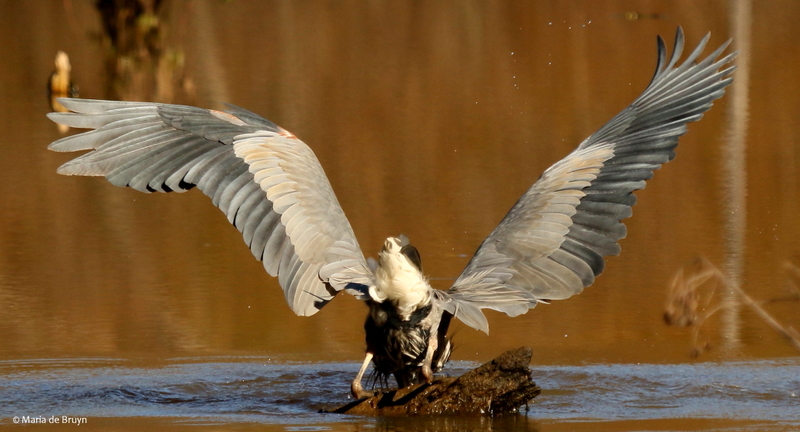 Next up – some beautiful raptors. 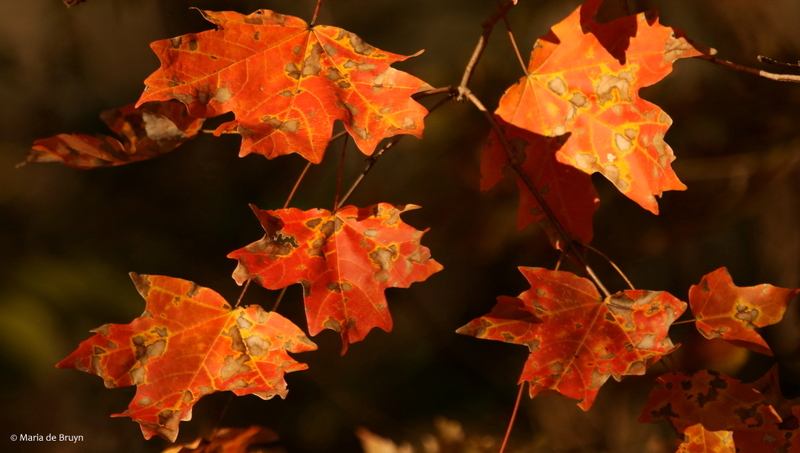 Although more people in the USA voted for the Democratic ticket than the Republican one, the electoral college system will likely lead to the installation of a Republican presidency unless election re-counts affect those designated votes. 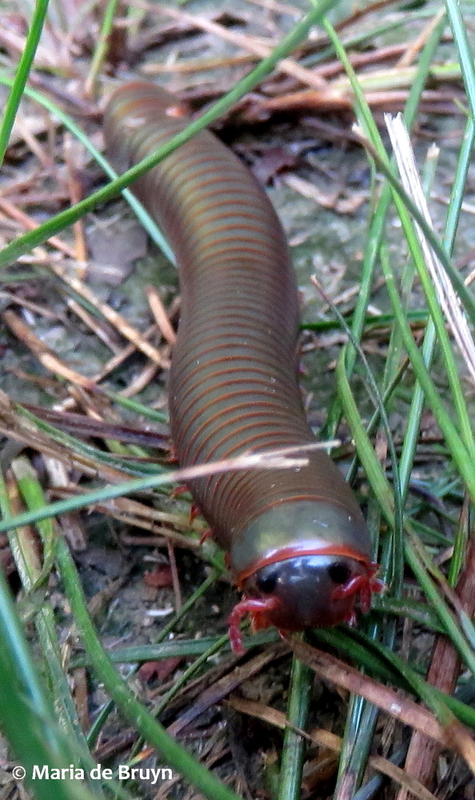 This distresses me greatly given the persons who have been announced as top administration advisers and cabinet members. 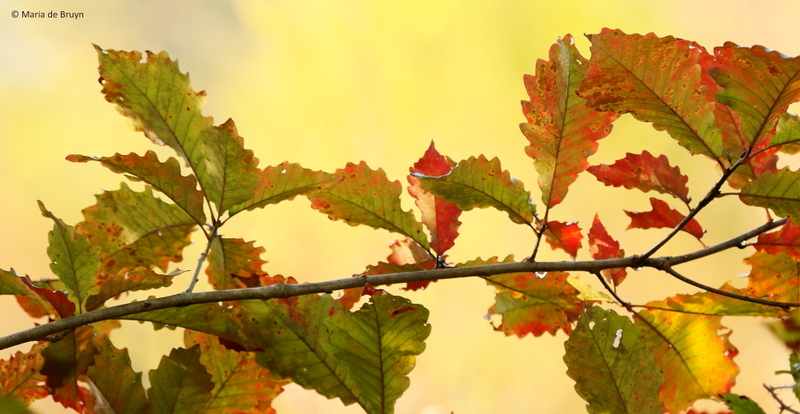 My work on social issues and on behalf of vulnerable people will continue and is increasing. 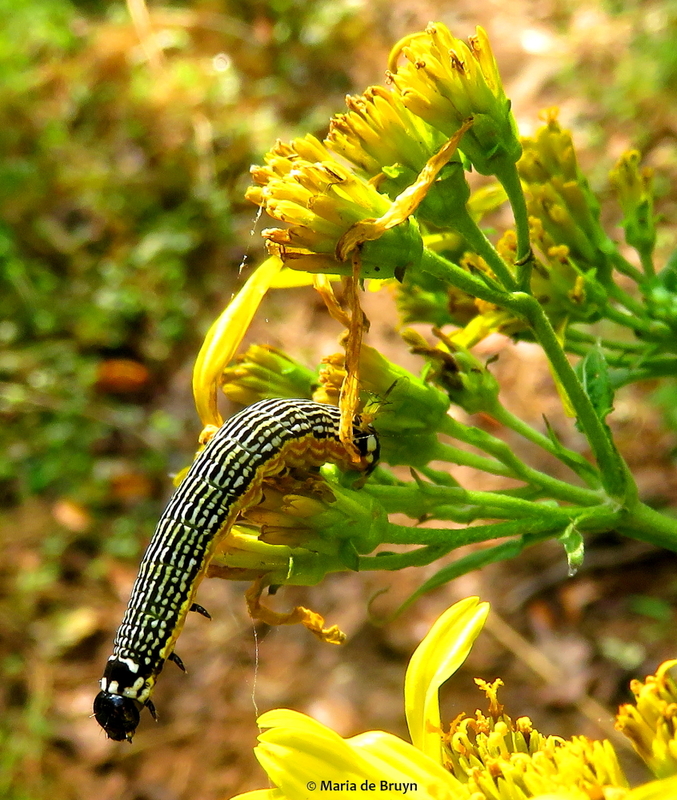 But in the meantime, to keep from going into a 100% depressed mode, I have sought solace in nature walks and spiritual strengthening in the flora and fauna I see. 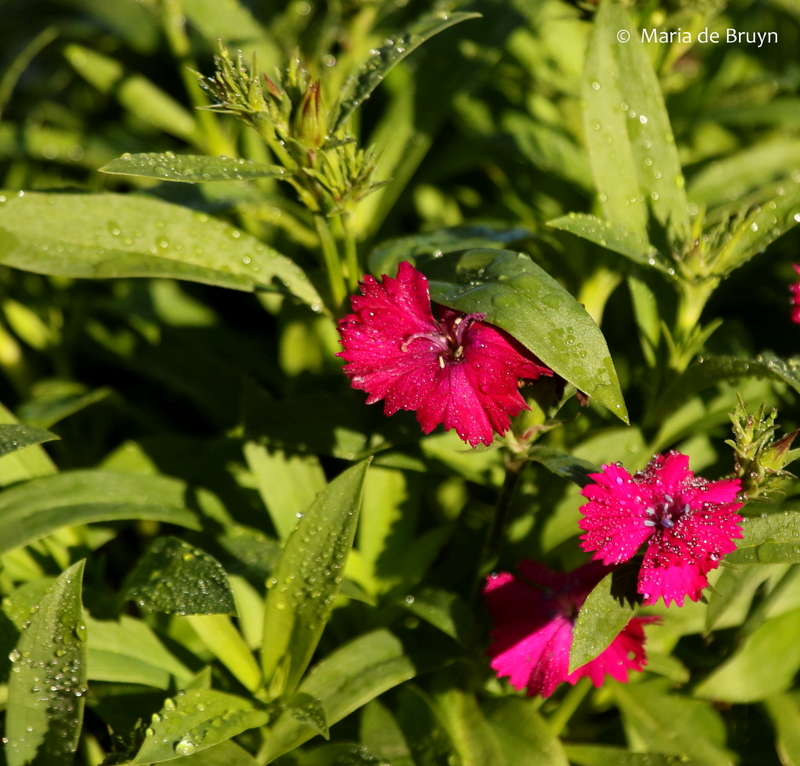 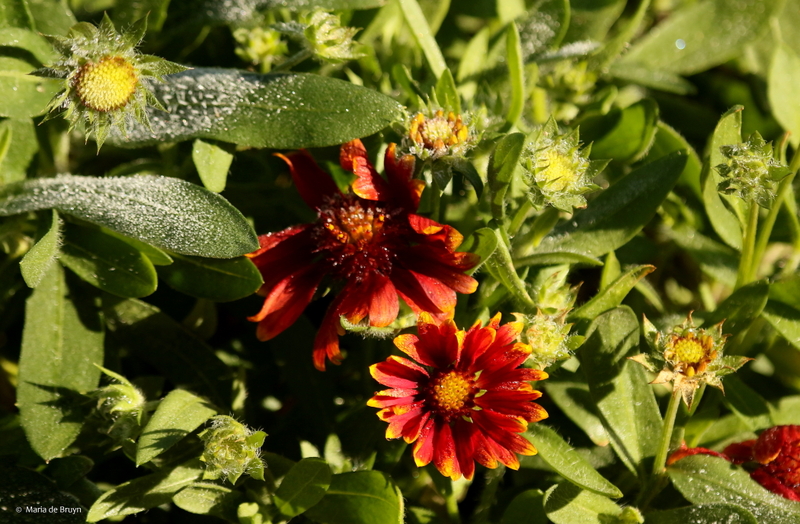 Early in the morning, you can find frost- and dew-covered plants and a few remaining flowers glistening in the sun. 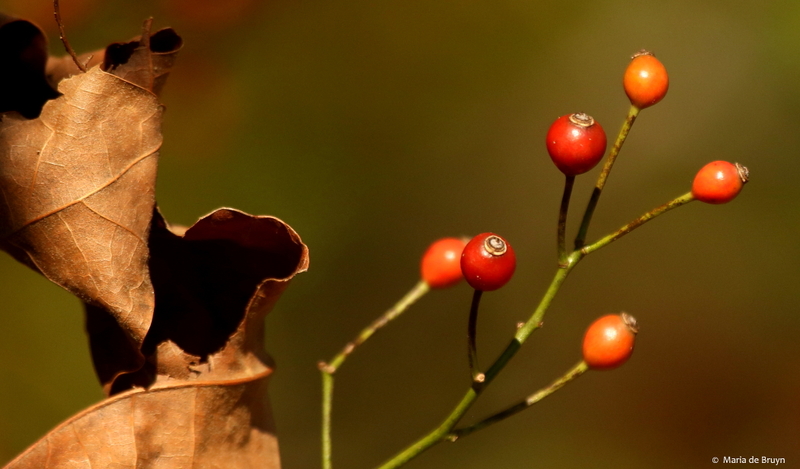 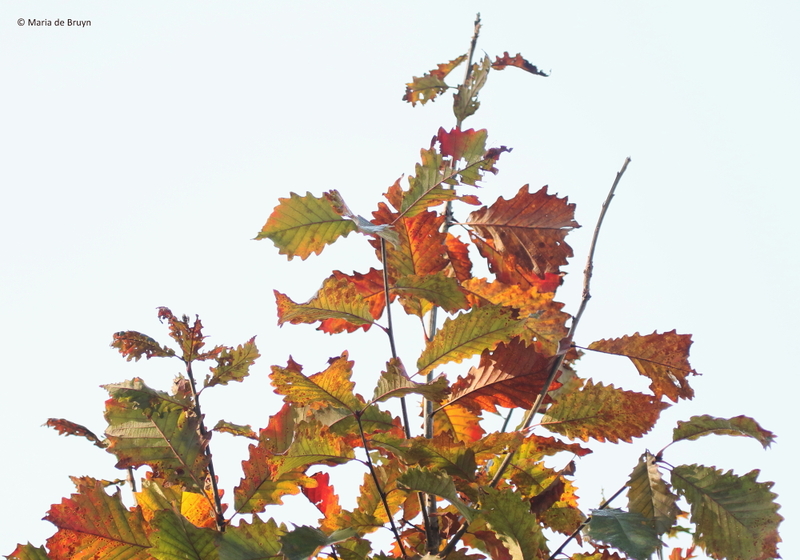 Later in the morning, the autumn-colored leaves make nice patterns as you search for birds high and low. 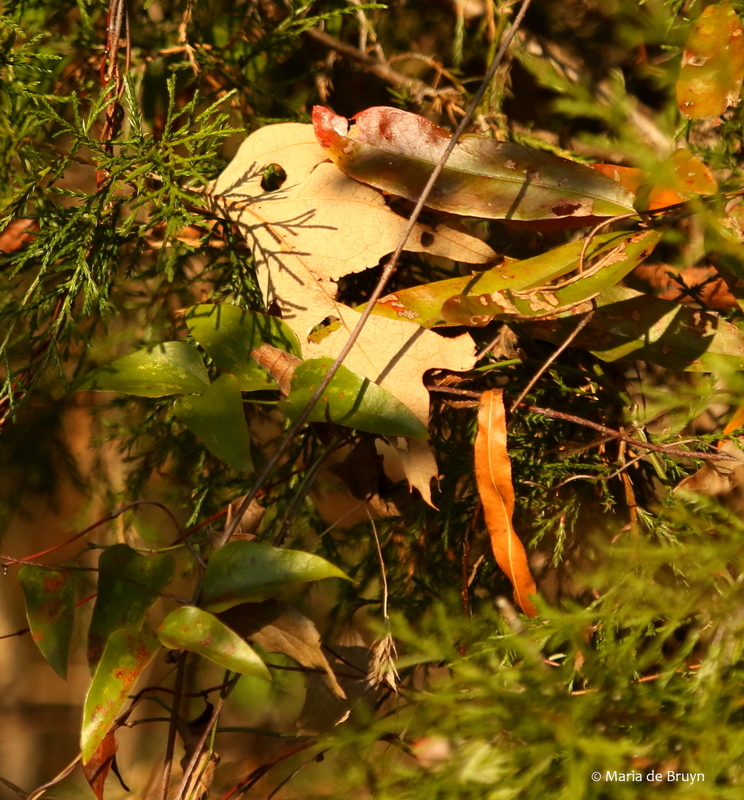 And occasionally you get to see the fabled “leaf bird”. 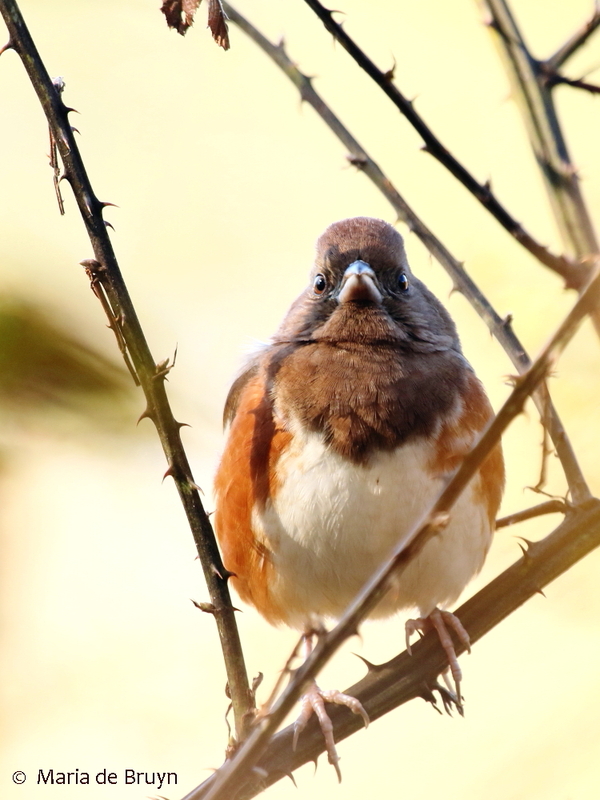 When looking high, you may find the birds looking down on you; face-level stares as you gaze straight ahead may also occur! 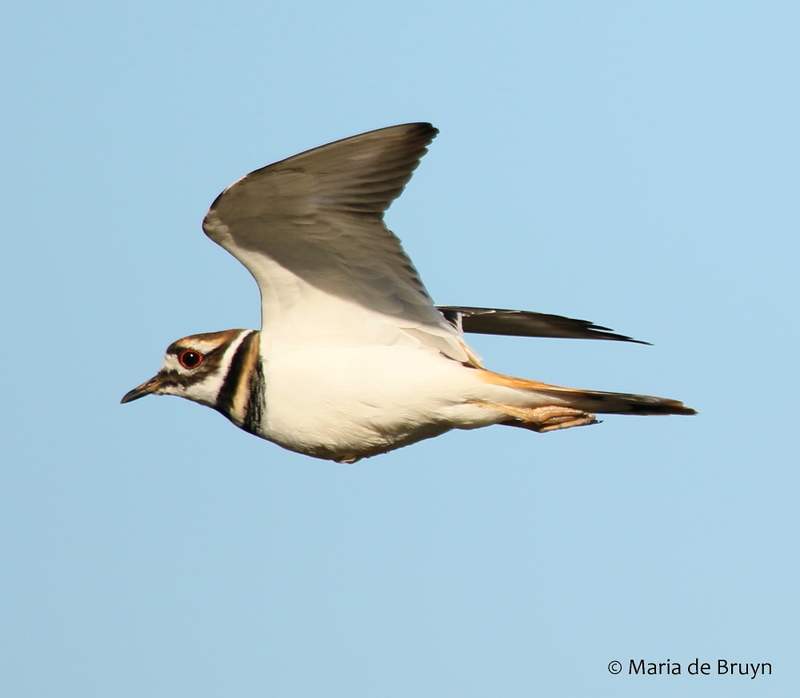 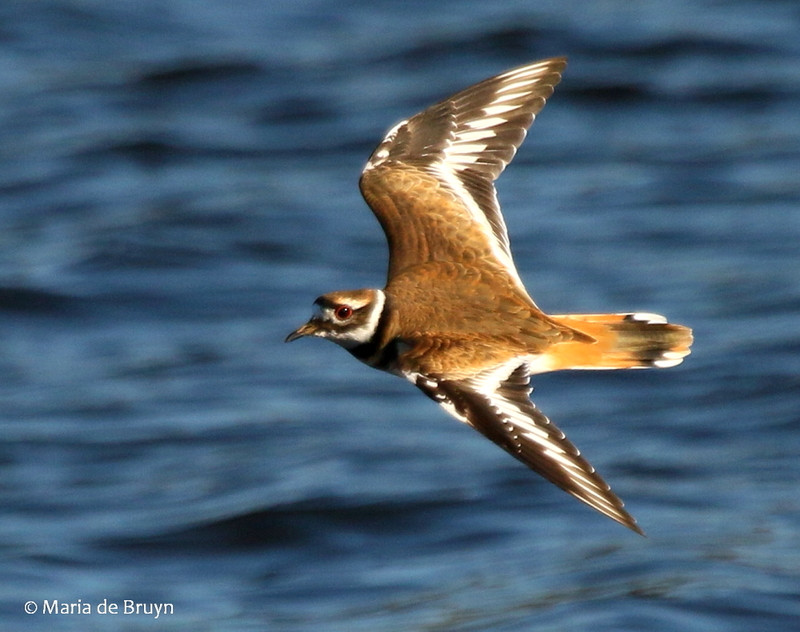 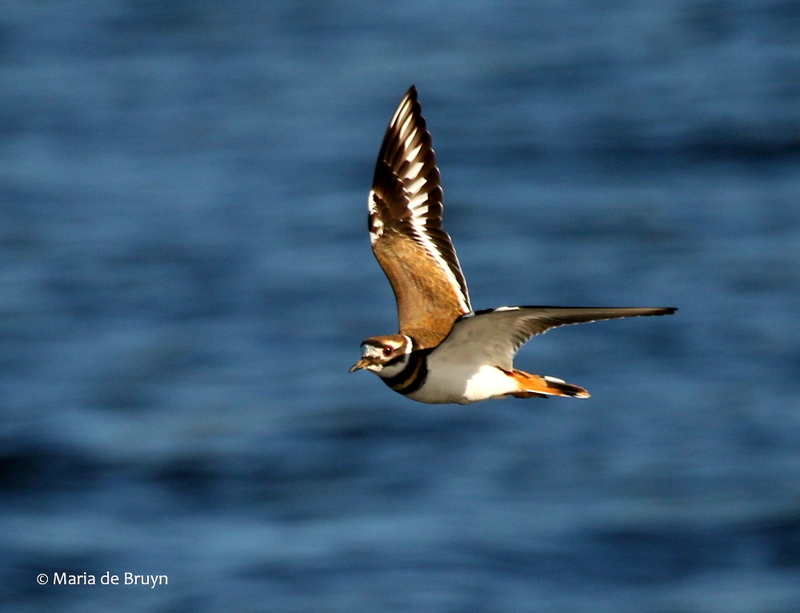 At Cane Creek, the killdeer (Charadrius vociferous) make their presence known by their distinctive calls and you can enjoy their gorgeous appearance as they fly over the lake. 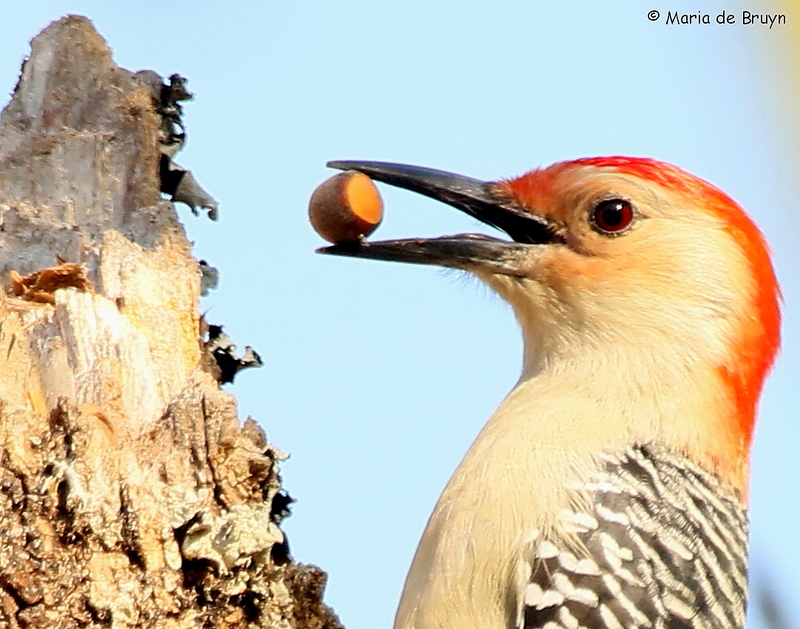 Many birds, like this red-bellied woodpecker (Melanerpes carolinus), are busy finding seeds and nuts for their meals. 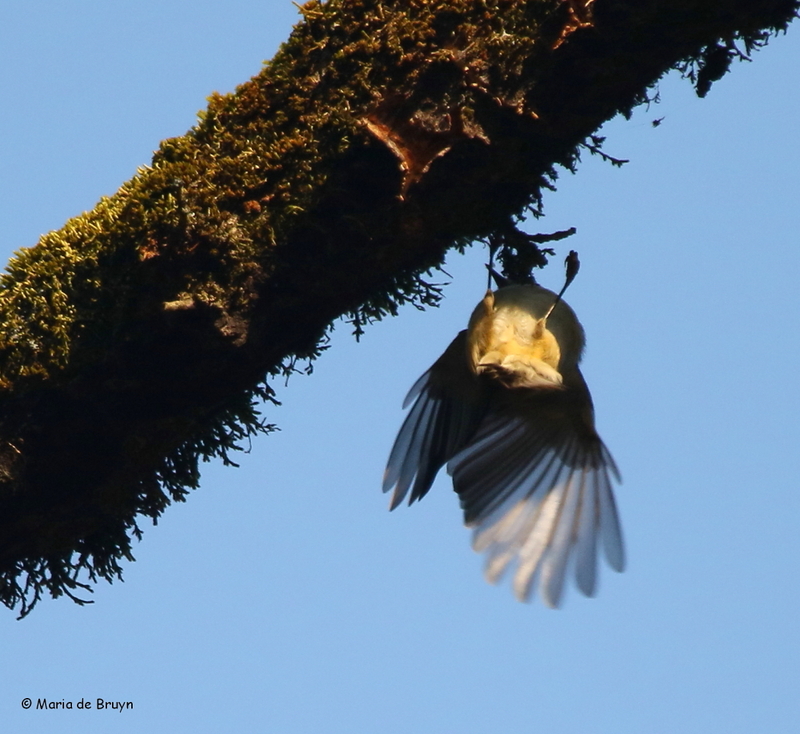 Sometimes, it involves hanging upside down to snag a tasty morsel and their wings help in balancing. 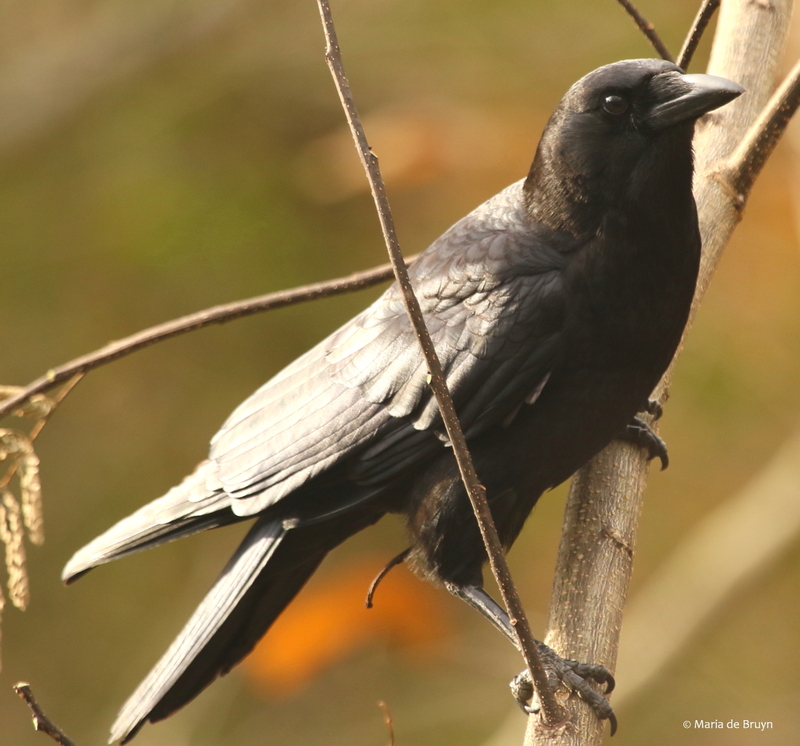 At Sandy Creek, a group of American crows (Corvus brachyrhynchos) flew down to investigate what had dropped to the ground from an overflowing garbage can but they soon flew off to seek more normal food elsewhere. 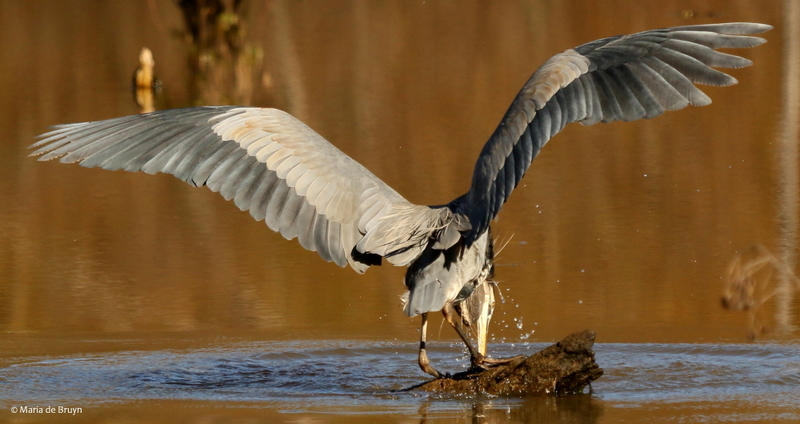 A great blue heron (Ardea herodias) was stalking the pond for fish; after I saw him (or her) snag a medium-sized fish, he turned his back so I saw the fishing technique from the rear. 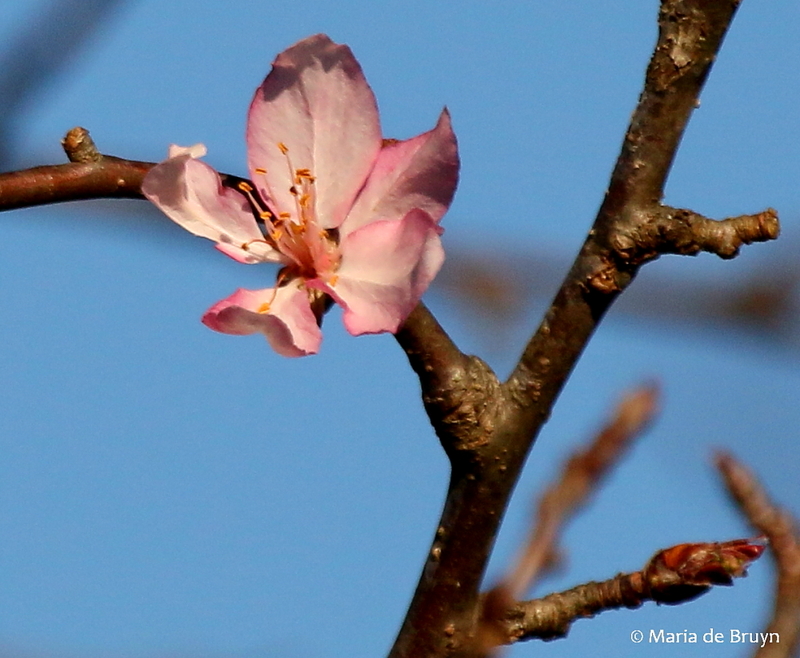 The flowering dogwoods (Cornus florida) at Cane Creek still had a few blossoms; at Sandy Creek and Mason Farm, they offered bright berries. 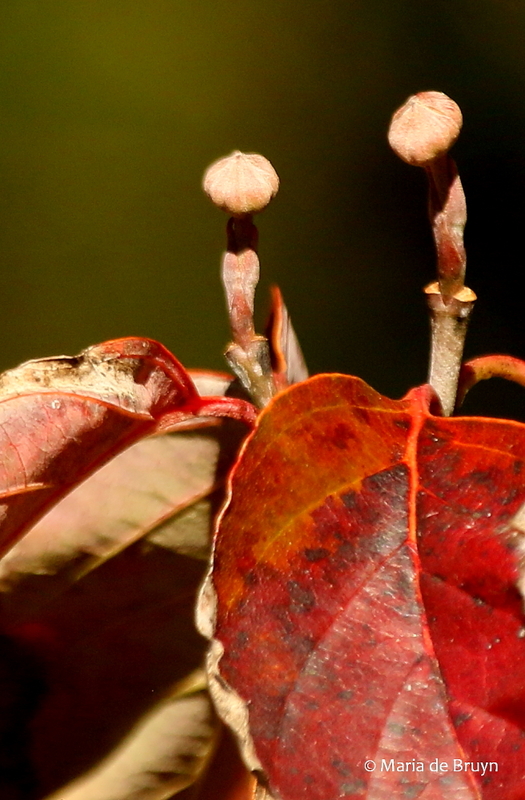 On one tree, they made me think of a movie-inspired alien peeking out of the branches with eyes on stalks. 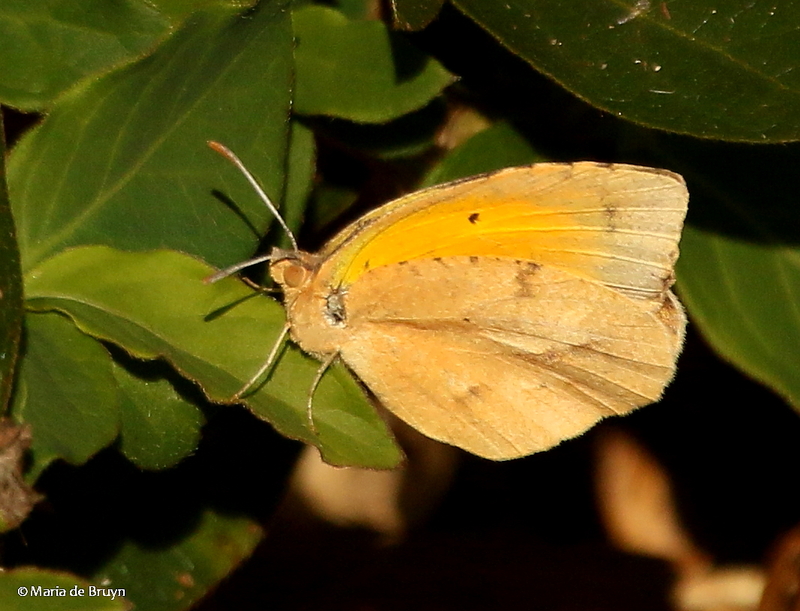 Up until the first morning frost this autumn, butterflies were still around, like this sleepy orange (Eurema nicippe); now that we have had several mornings of below-freezing temperatures, the butterflies are mostly gone as are the majority of bees. 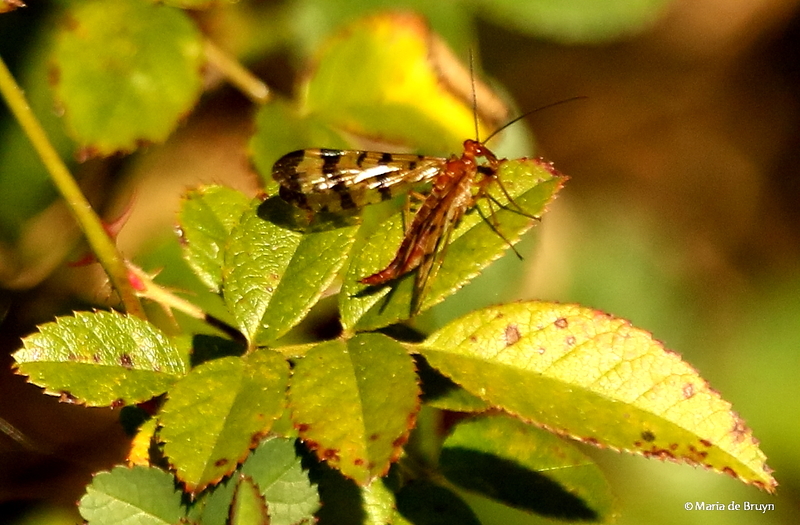 A scorpion fly (Panorpa) was in evidence at Cane Creek to my surprise. 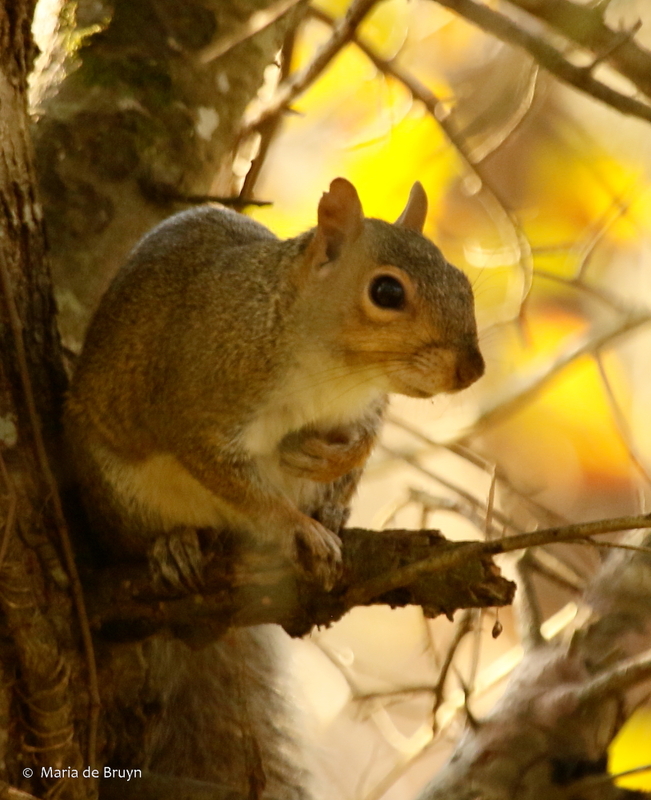 In between bird spottings, Eastern gray squirrels (Sciurus carolinensis) chittered at me at all three parks. 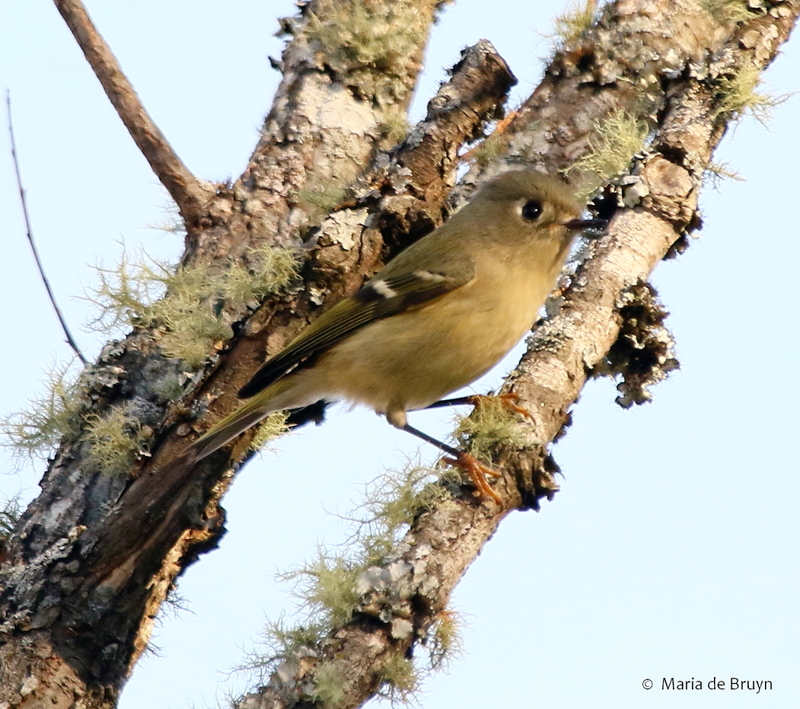 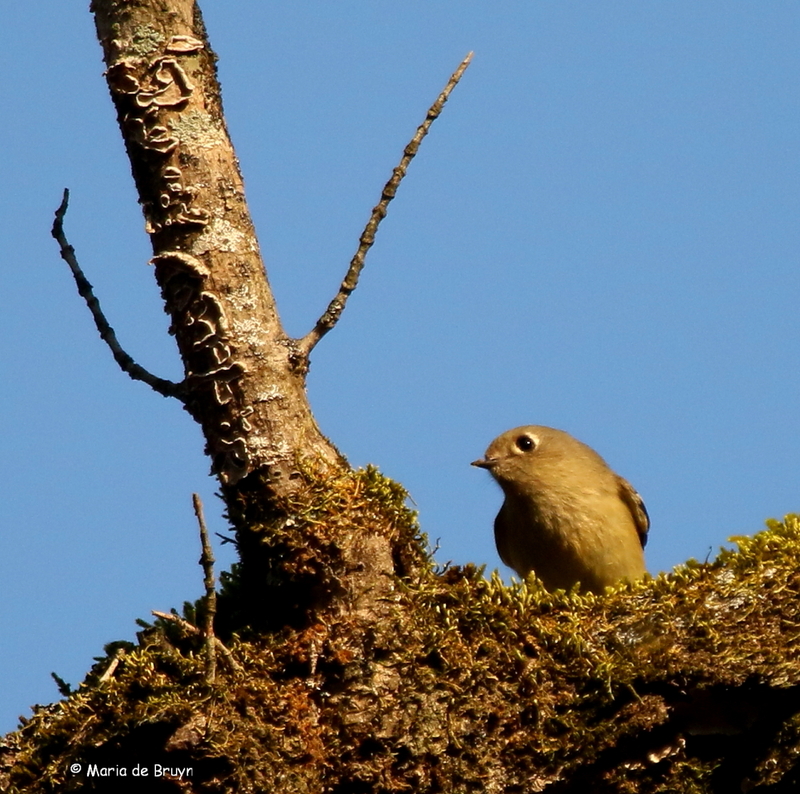 And I was pleased to see some ruby-crowned kinglets since the one that has enjoyed the suet at my house the past three years hasn’t appeared yet. 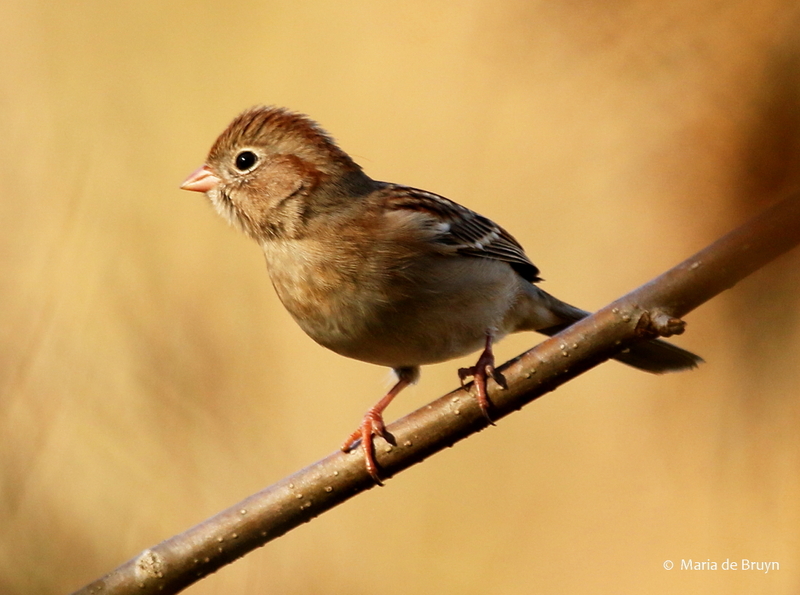 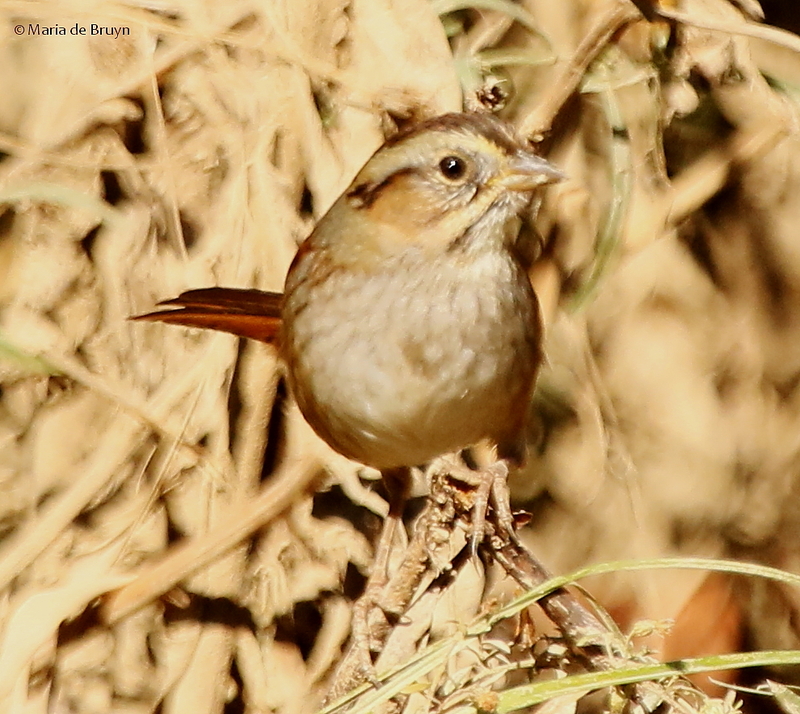 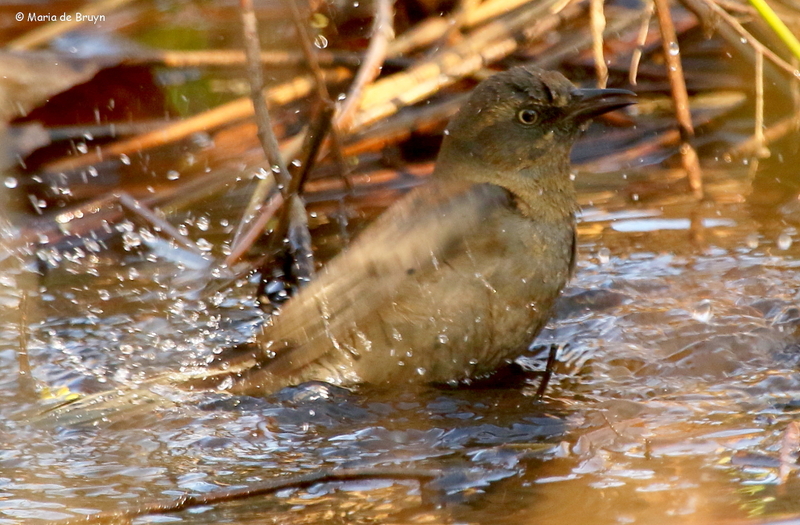 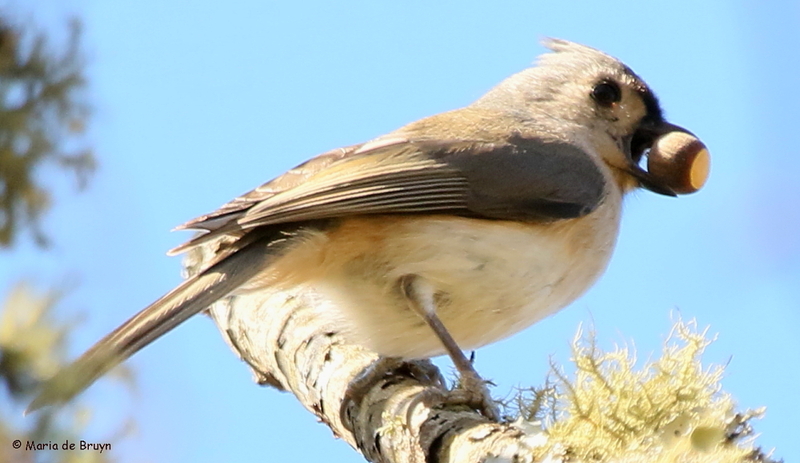 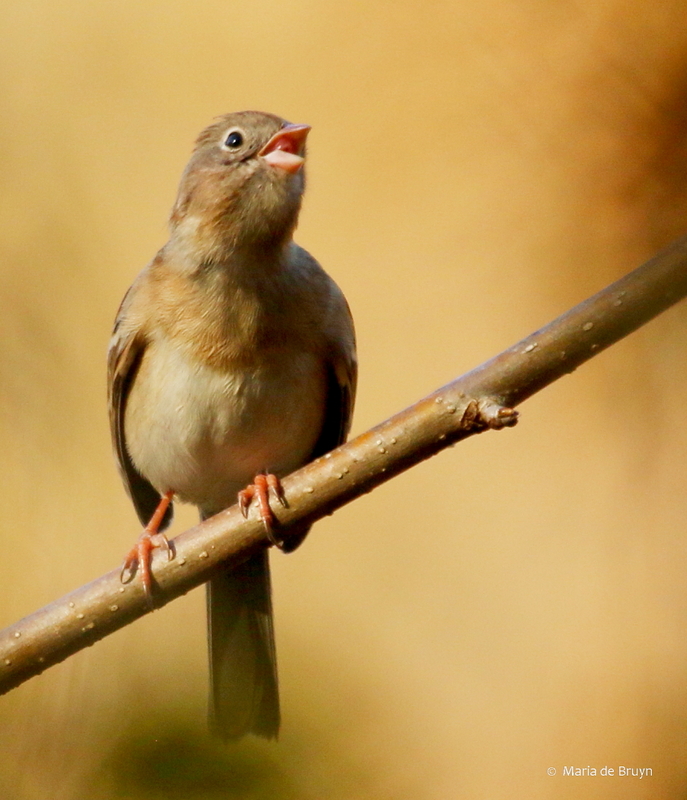 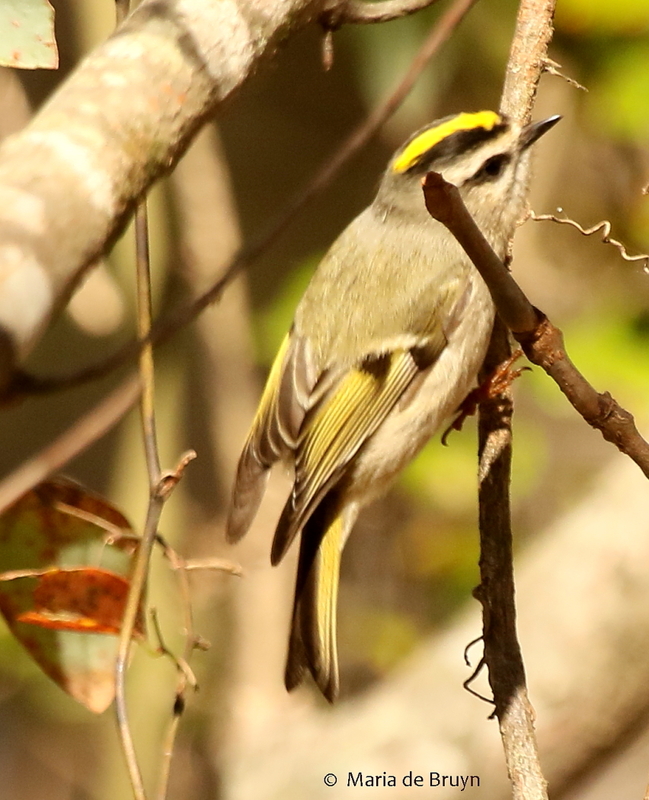 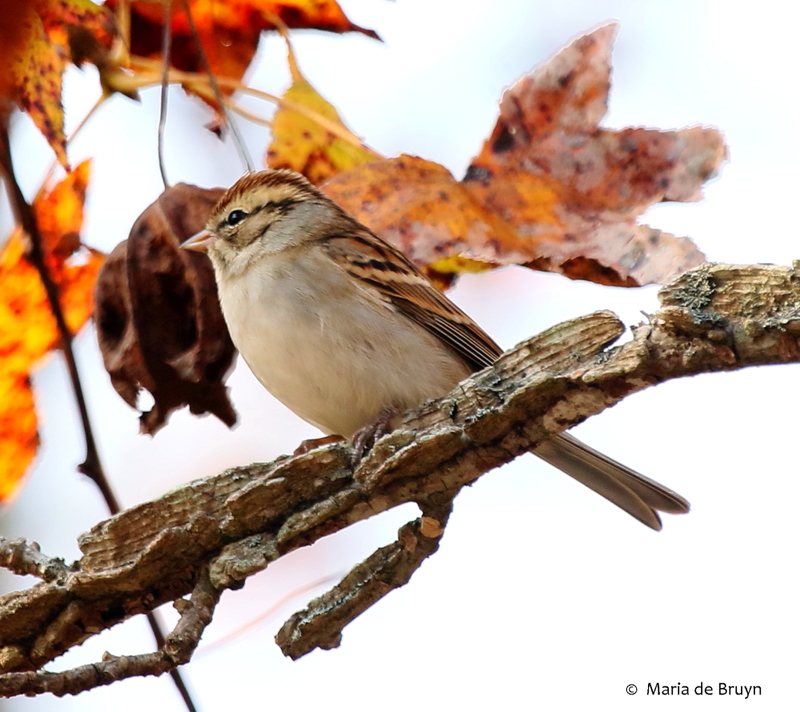 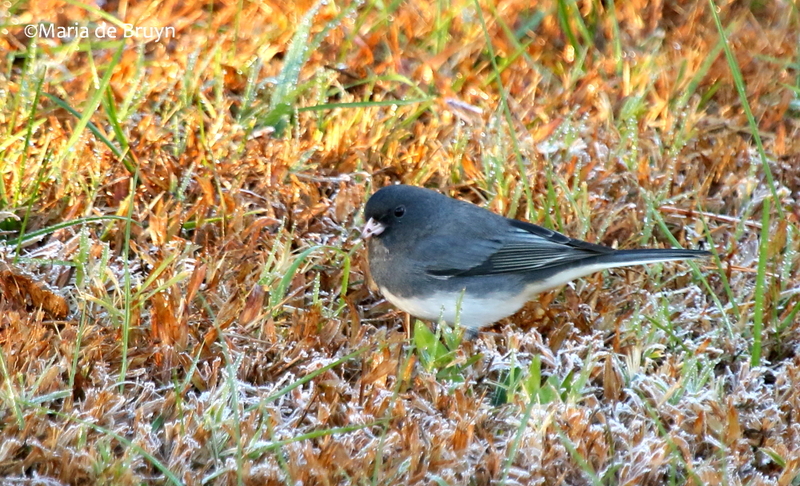 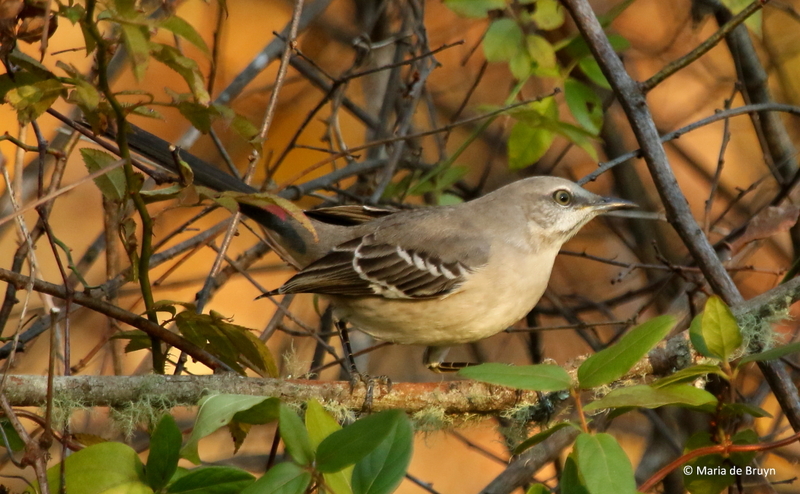 Some of the birds common in my yard are welcome sights at the nature reserves, too. 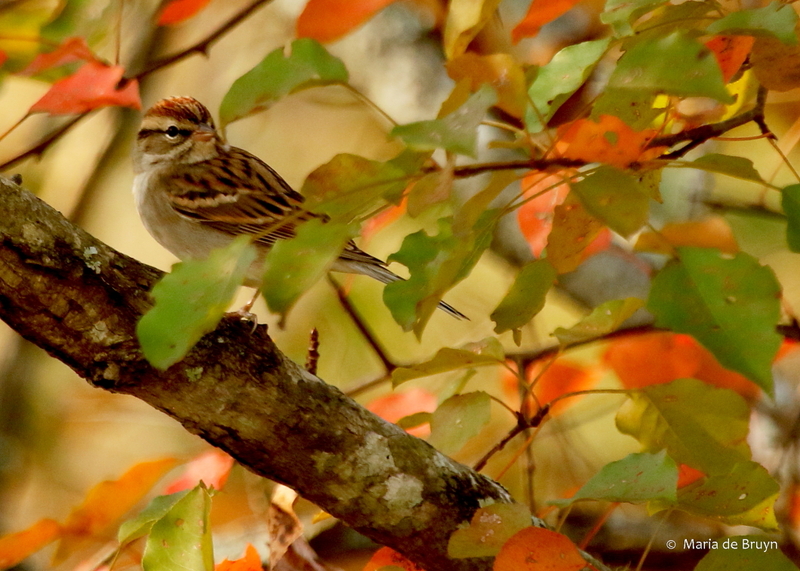 And the occasional or rare visitors to my yard are appreciated in the woods and fields, too! 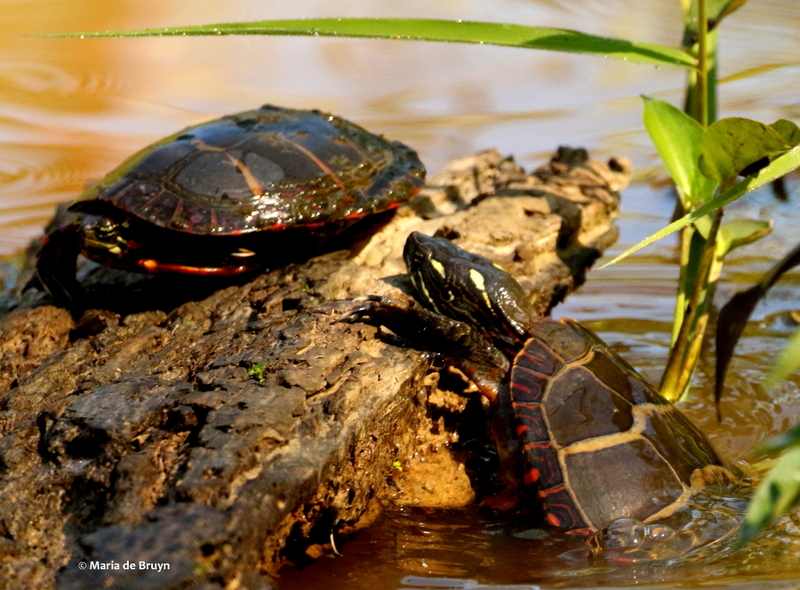 Preserve the environment, make it part of your daily life and spread it to the community! 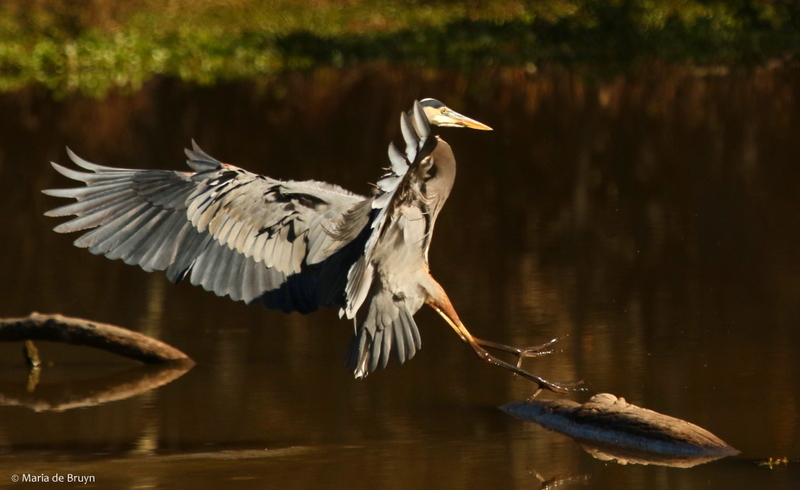 After watching the baby herons today at the Sandy Creek Park rookery (blog coming on that!! 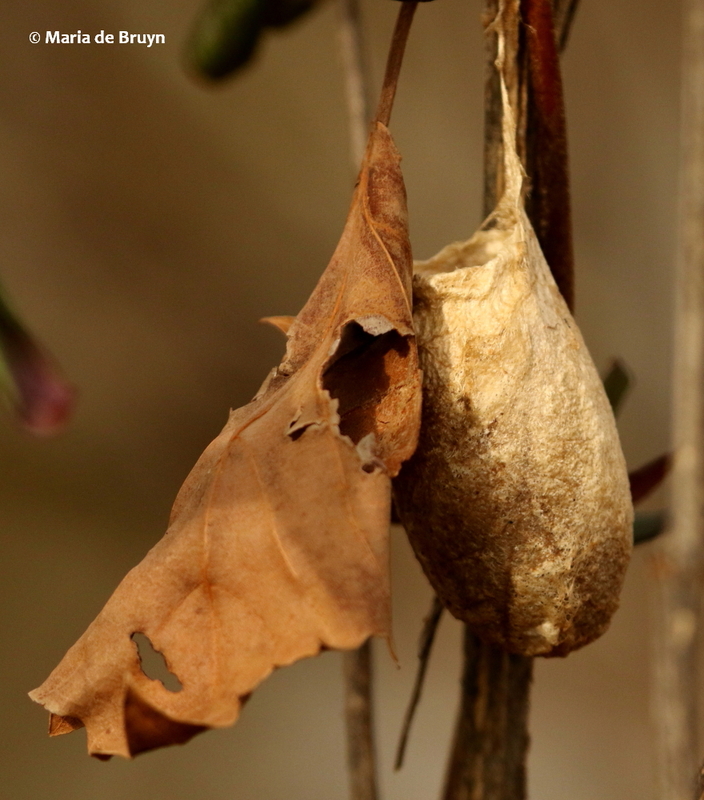 ), I walked down a path taking photos of plants and flowers, ending in a spot where I wanted to check on what had happened to a moth cocoon. 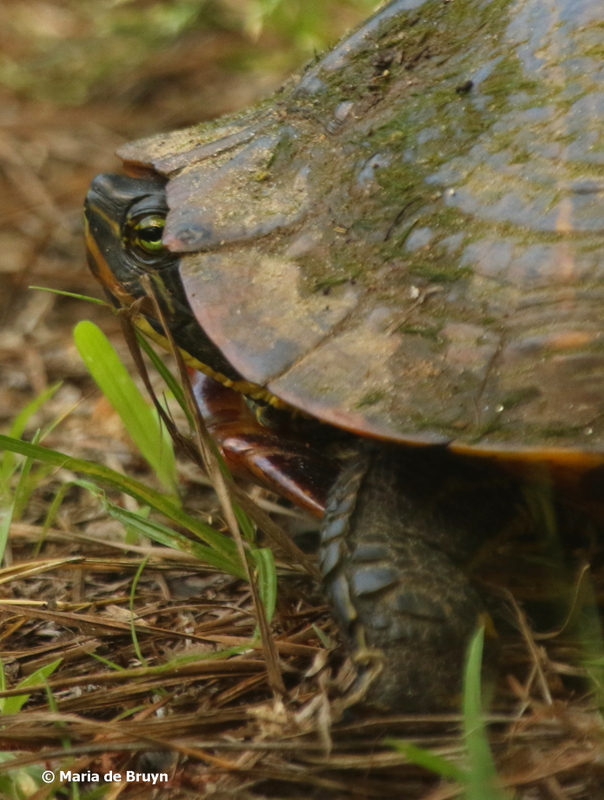 To my surprise and delight, when I glanced to the side, I saw a yellow-bellied slider (I think, Trachemys scripta scripta) in the process of laying her eggs. 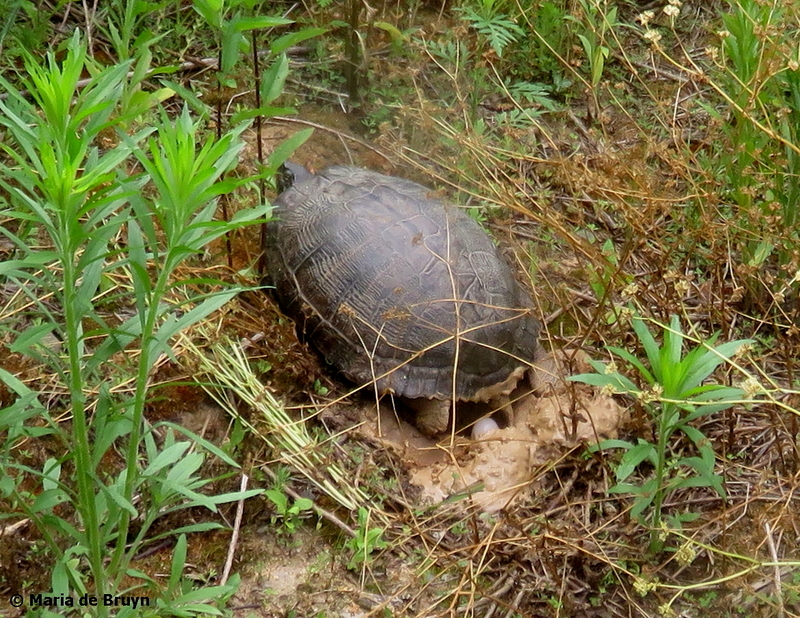 I didn’t want to get too close but was really curious as well since this would be the first time I had seen a turtle laying eggs. 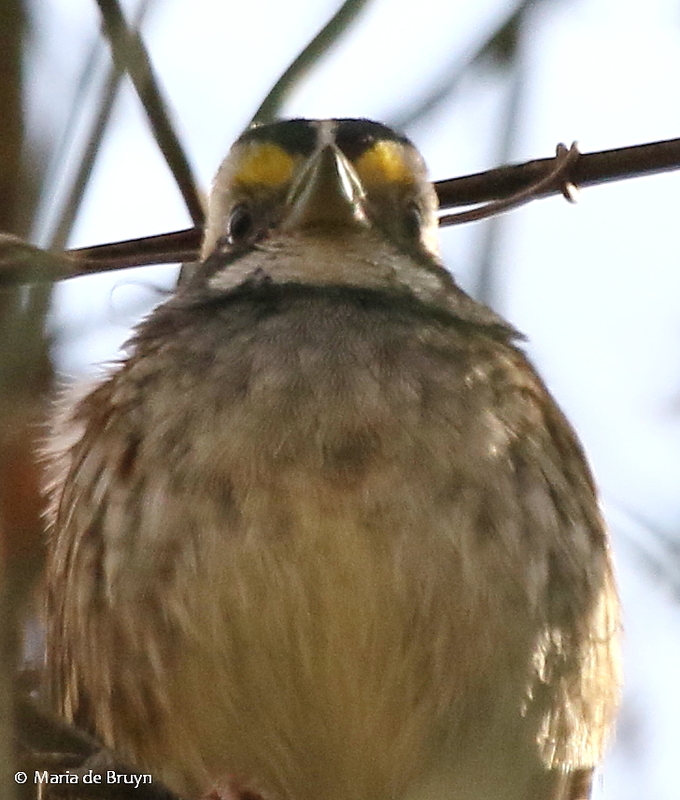 So I inched a bit closer and witnessed her last egg dropping down into the nest. 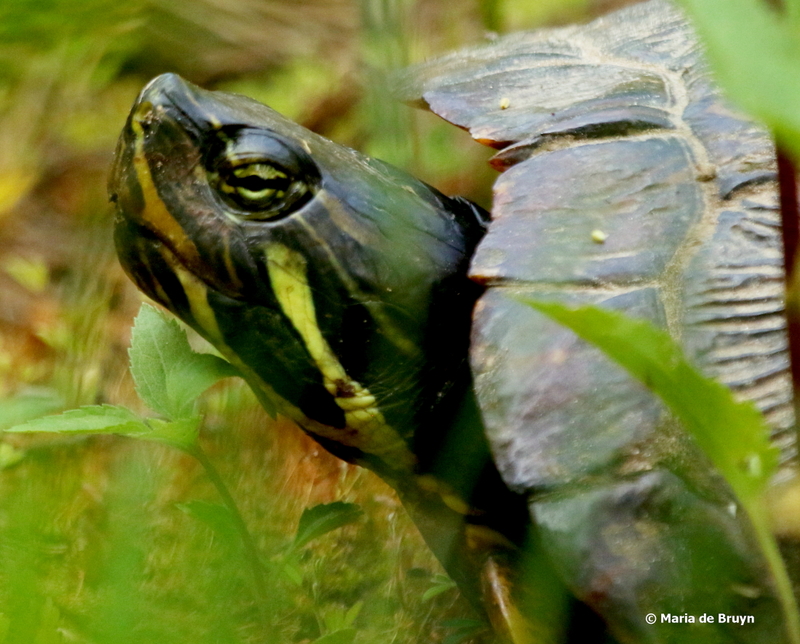 Happy turtle and happy me! 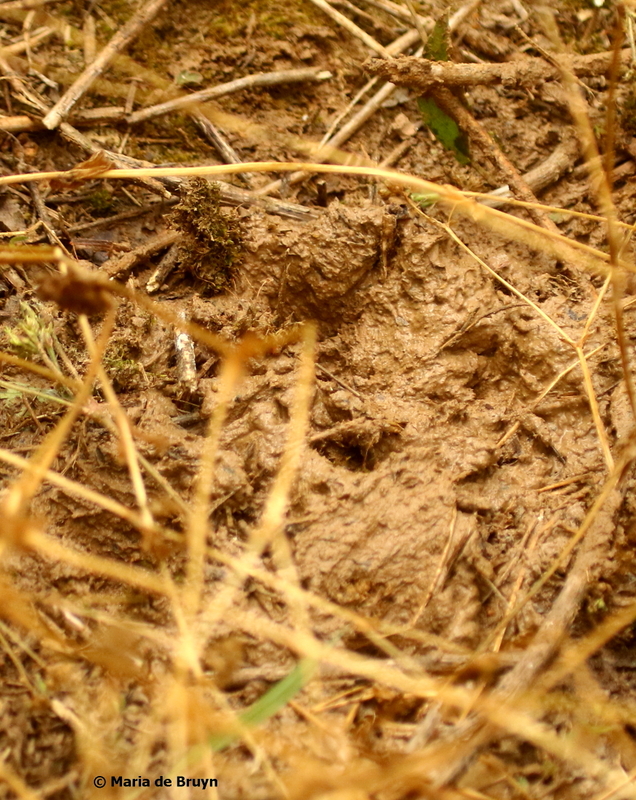 She immediately began covering it by pushing dampened earth over it with her hind legs and feet. 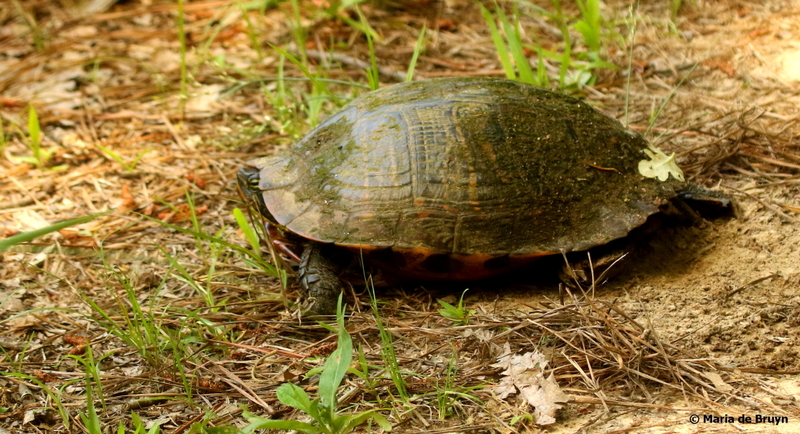 Mother turtle kept an eye on me during this process, pausing if I moved too close. 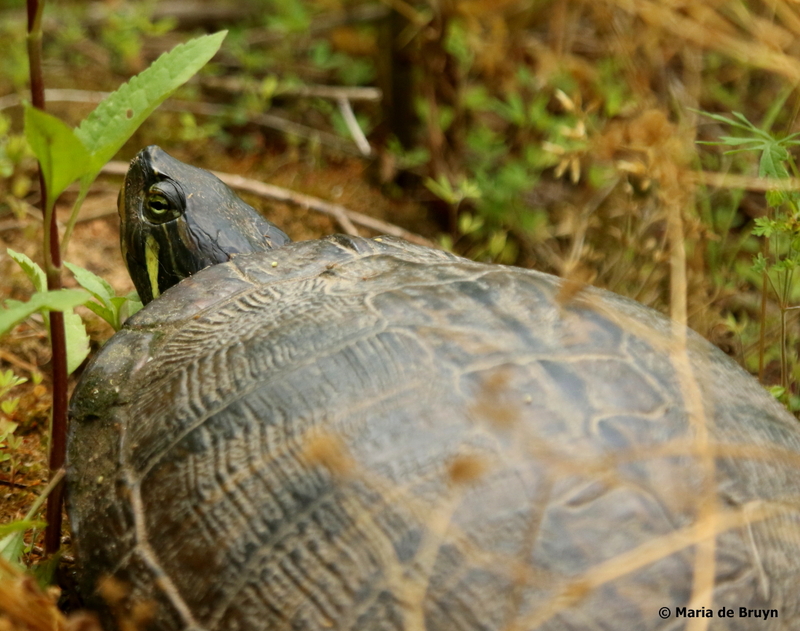 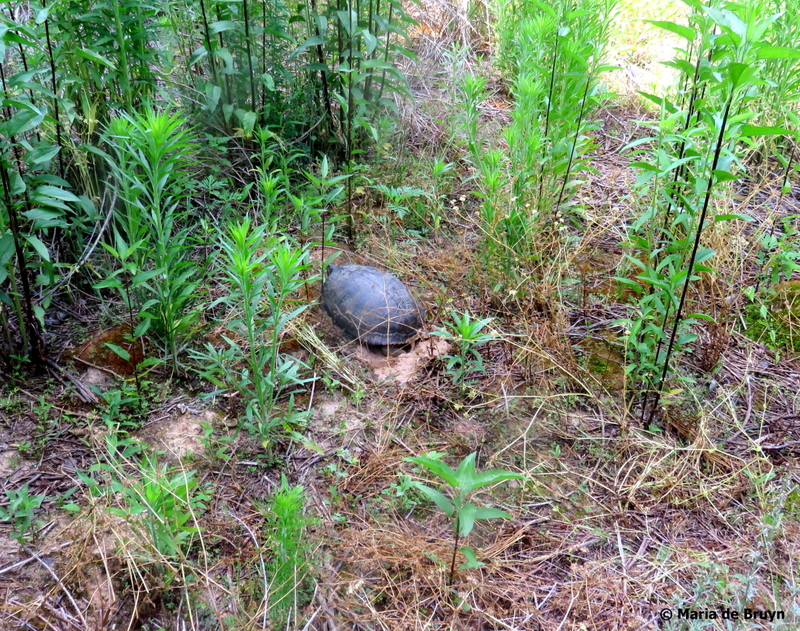 At one point, I continued along the path to give her a little privacy and came upon another turtle – perhaps also looking for a nesting site? 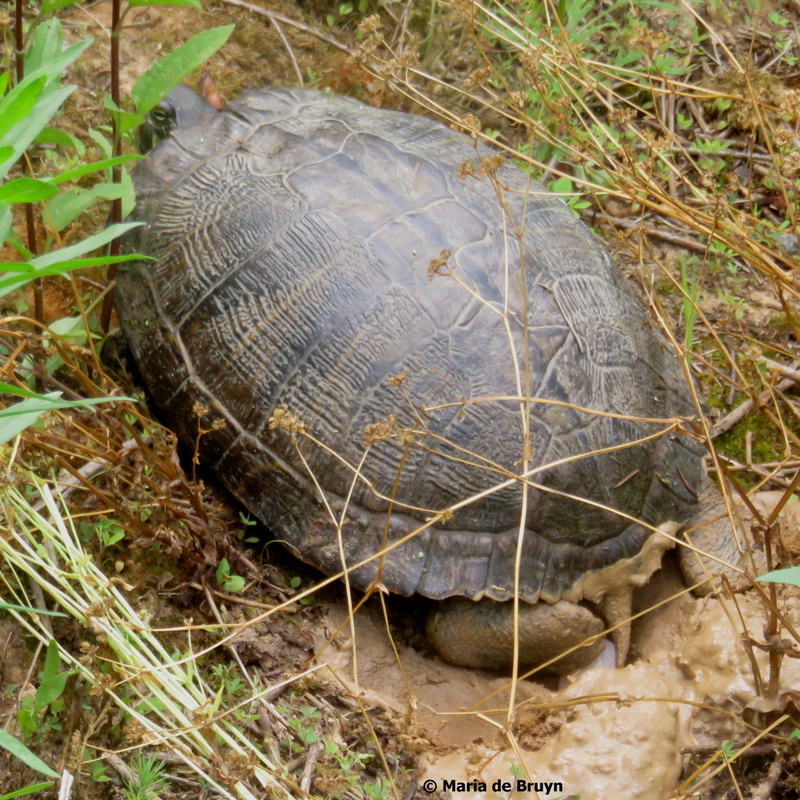 This turtle’s eggs will now incubate for a period of two to three months. 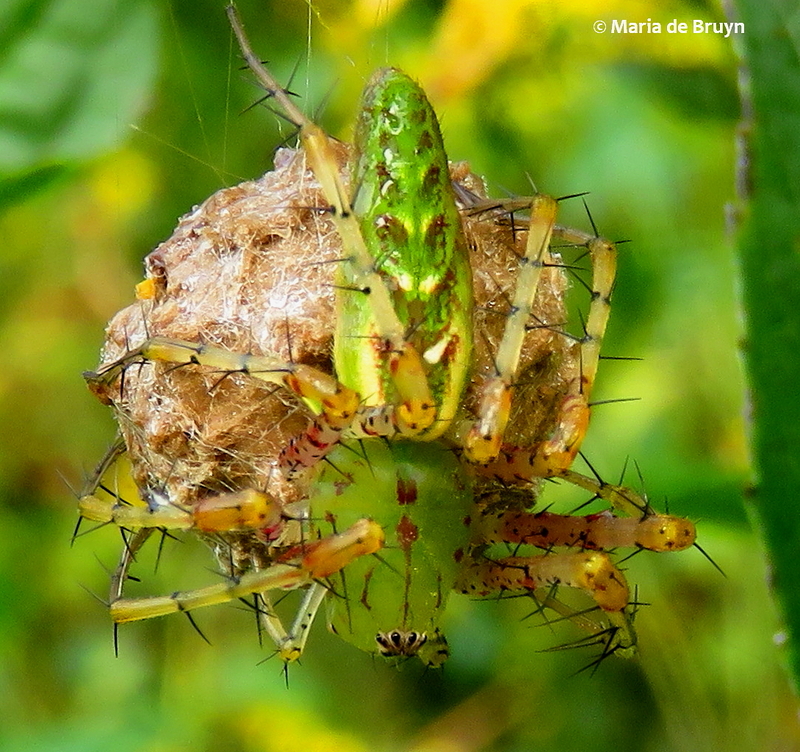 When the babies hatch, they will likely stay near the nest during the winter, eating insects, spiders, carrion – an almost exclusively carnivorous diet. 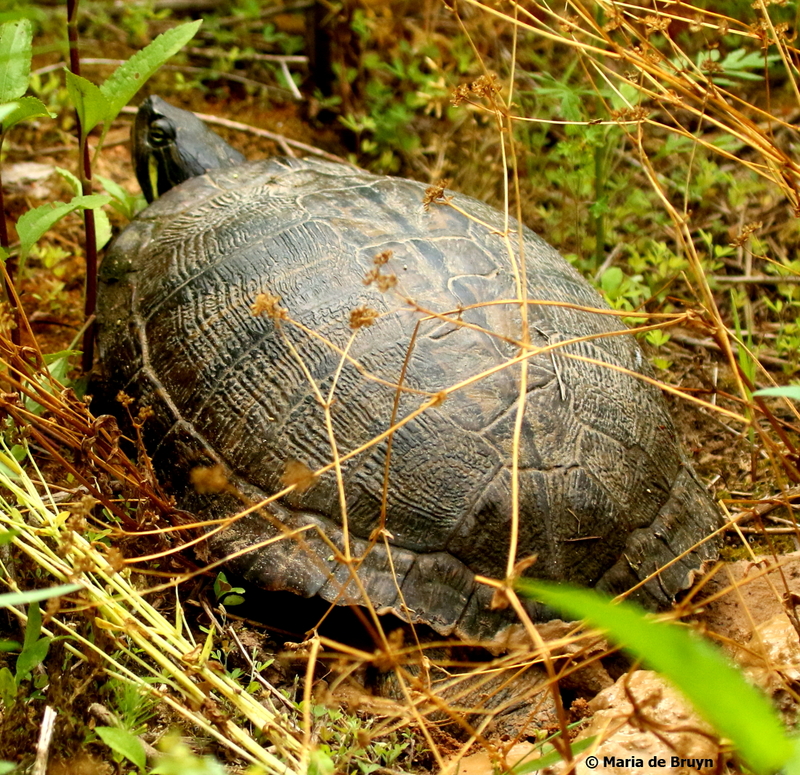 If left alone by humans and predators, they can grow up to live as long as 30 years in the wild. 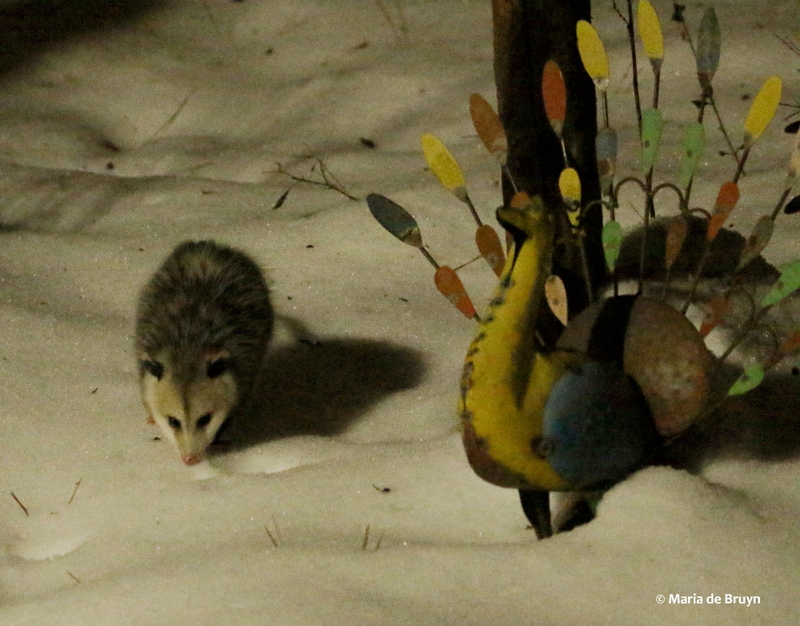 I left mom to the task of covering the site and returned about 20 minutes later. 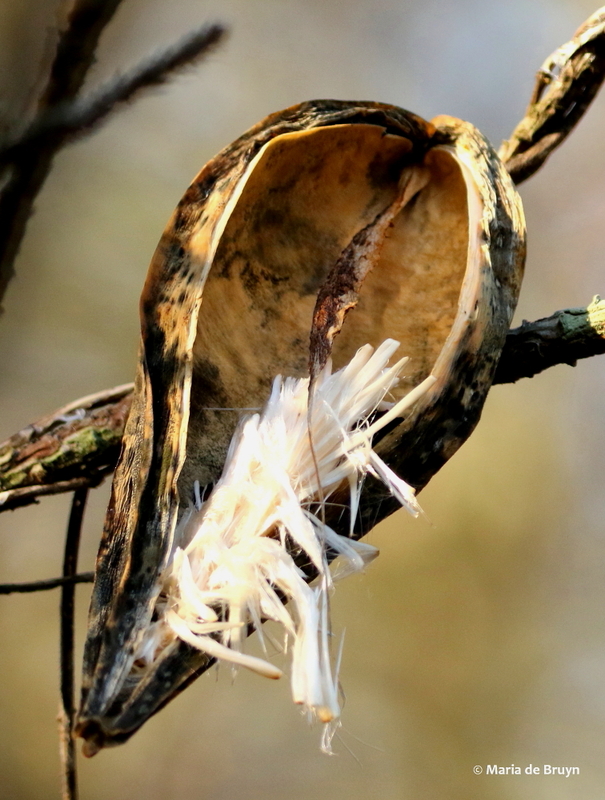 She was nowhere in sight and it was only because I had seen her on the nest that I could tell where she had laid the eggs. 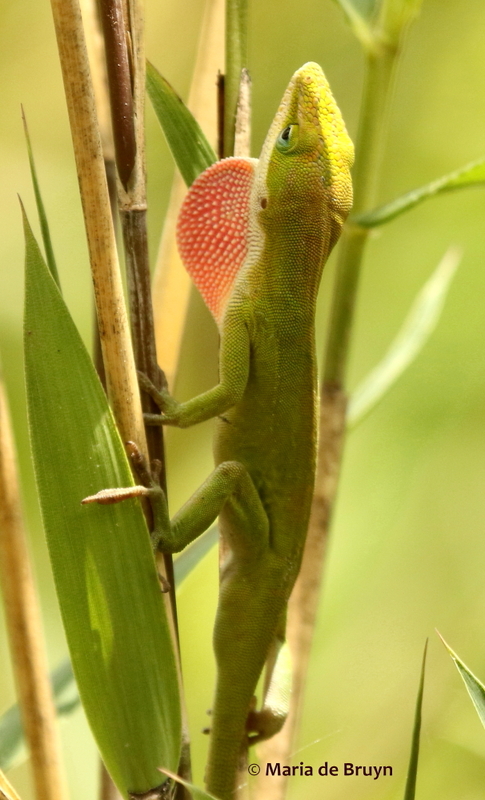 I hope I remember the site so that I can return in a couple months and perhaps be lucky enough to see the babies emerge. 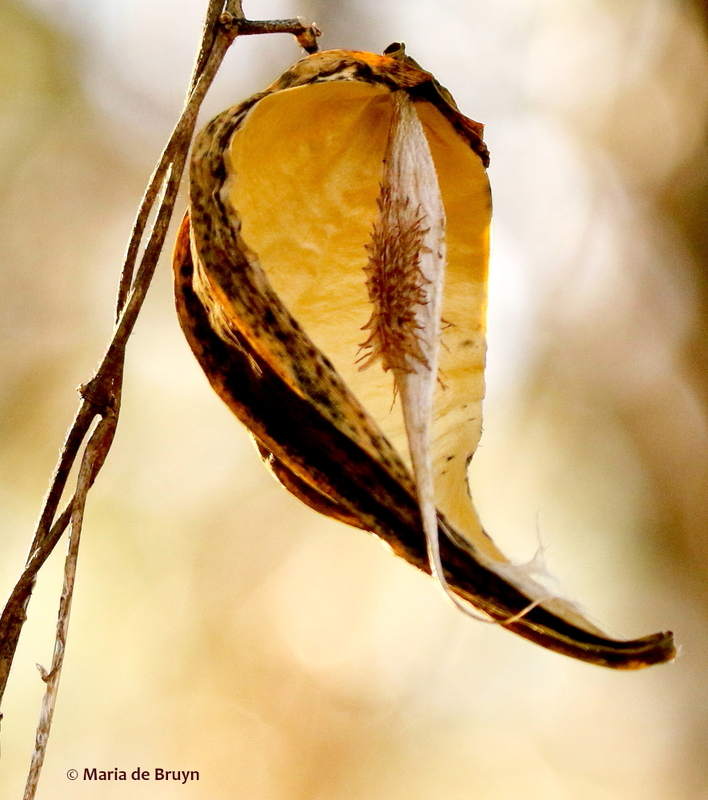 If you click on some photos, you can see them in a larger format. 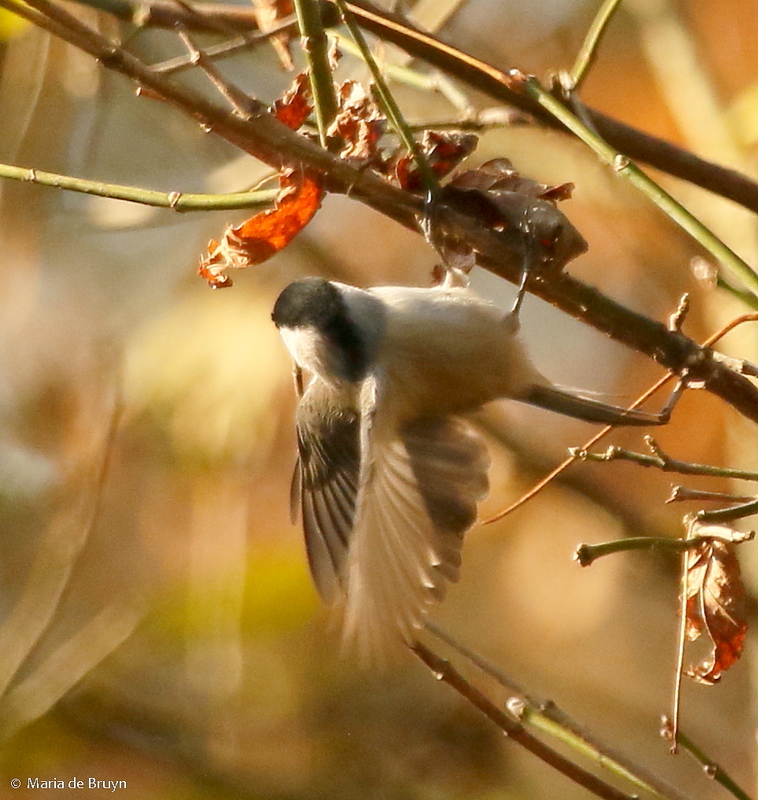 If they don’t seem quite sharp, it may be because I reduced the resolution before posting. 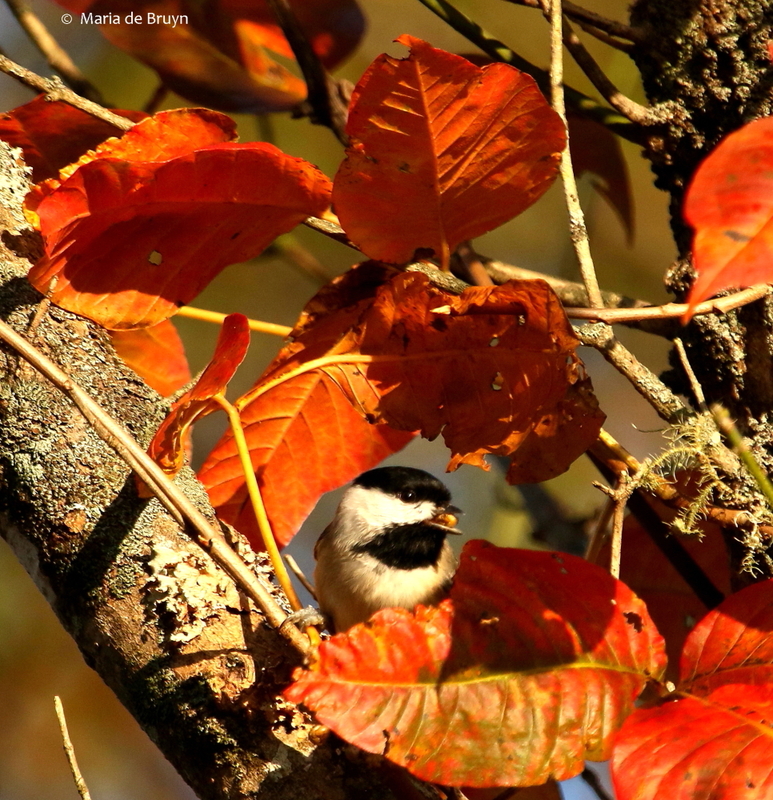 The new New Hope Market is selling my photo cards in addition to delicious food. 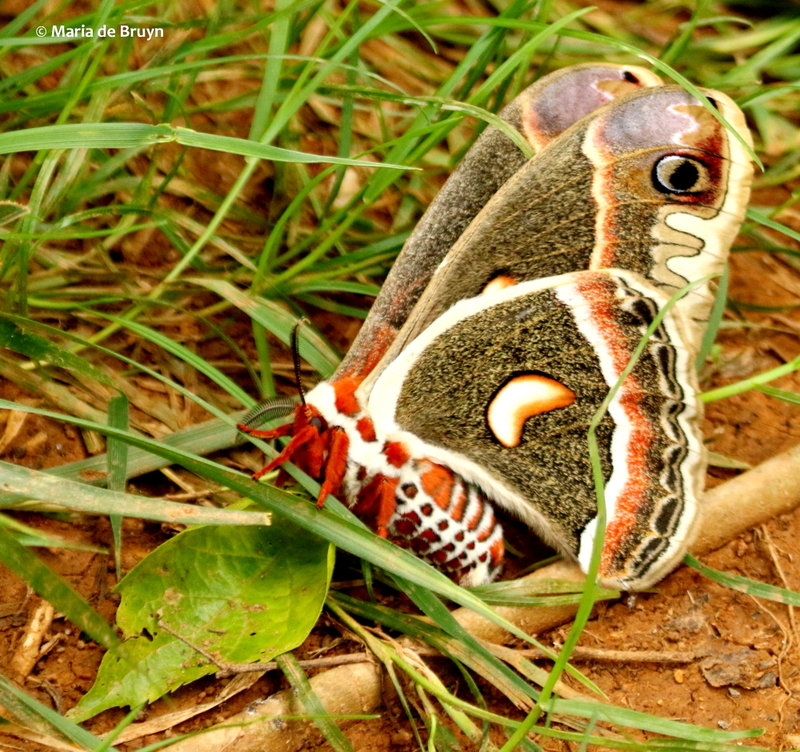 Do visit them!